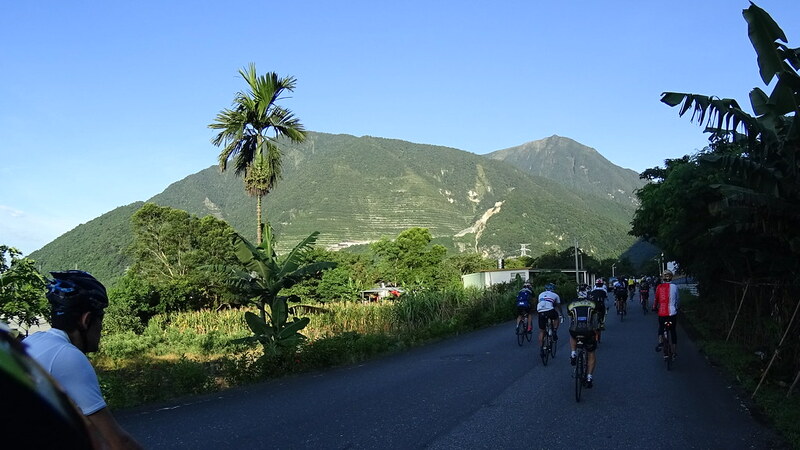 Starting Location: Xiulin (花蓮), Hualien, about 4 hours train ride from Taichung via Puyuma Express. 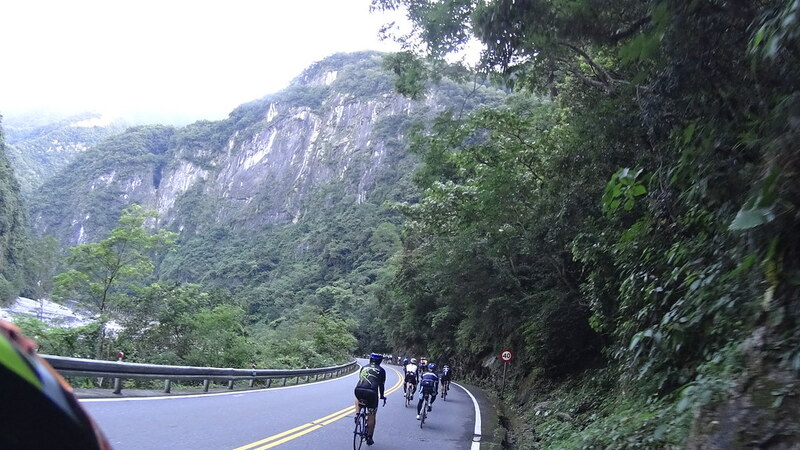 Ultra long hill climb (89 km upward from 0m to 32750m elevation). 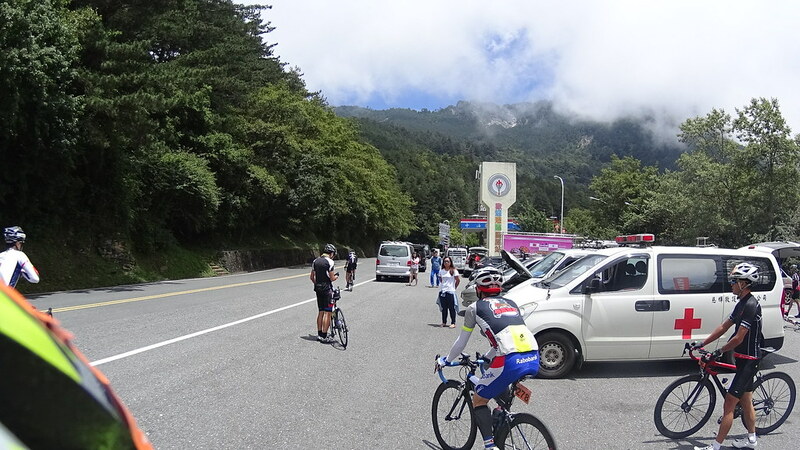 Hardest climb was positioned at the last 15km, with average grade > 10%. 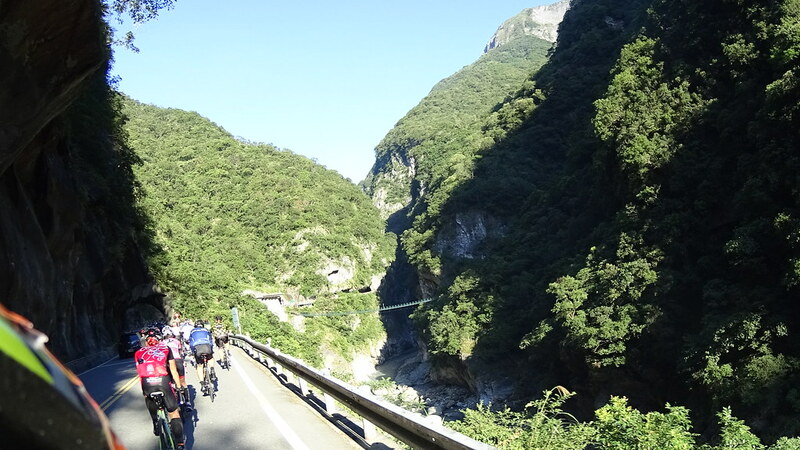 Great Taroko Gorge scenery: marble cliffs, steep valleys, suspension bridges, buildings with waterfalls. 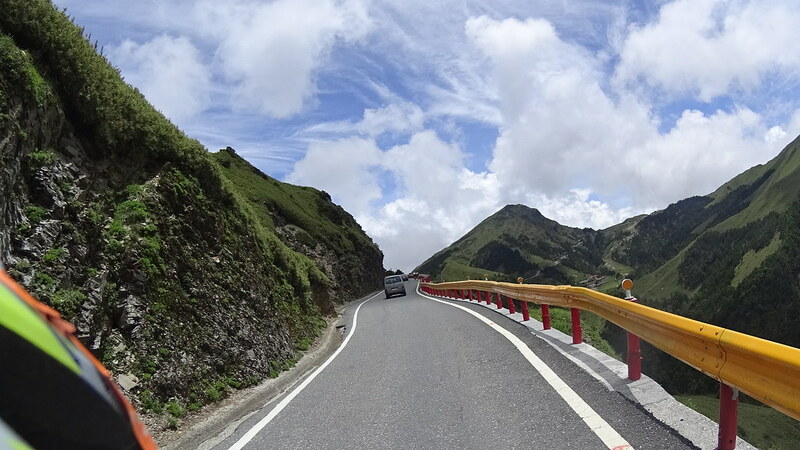 Highest roadway in Taiwan. 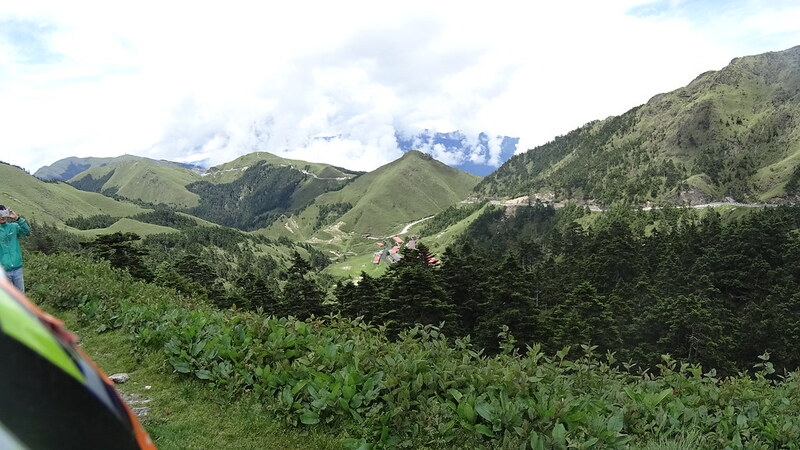 Great Alpine view above treelines. 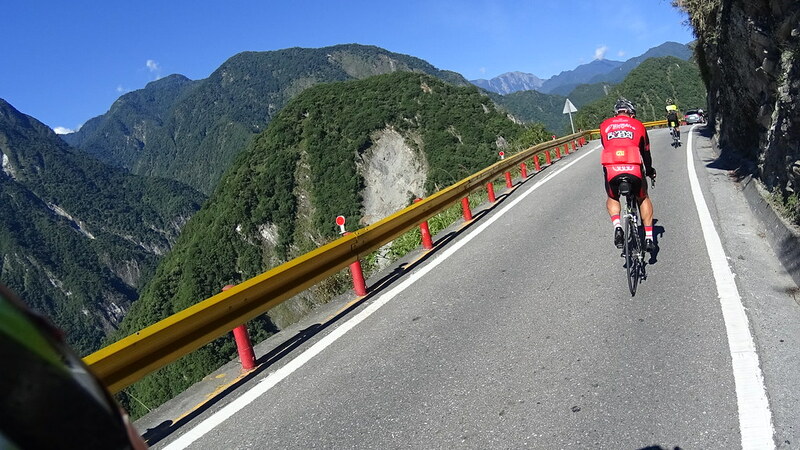 In the United States the highest single-elevation a road cyclist can get are at max 7000 feet (2667 meter) due to snow. 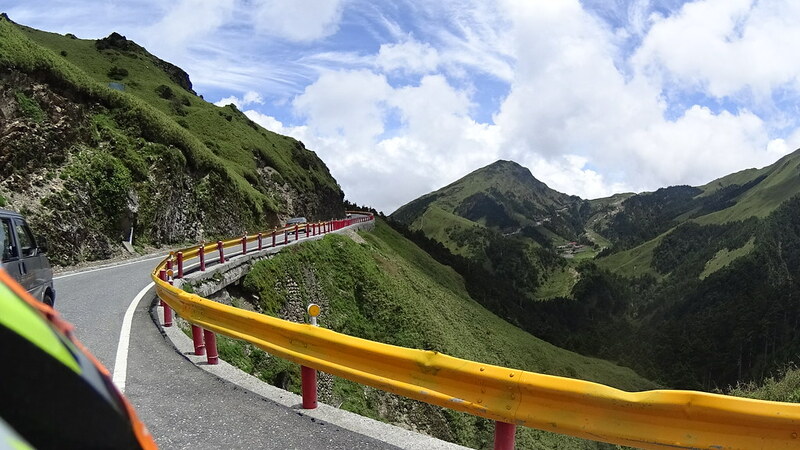 In Taiwan, due to its warmer climate and narrow sizes, you can go from 0 at shoreline to the highest point, 3275m (10744 feet) in 89km (55 miles). 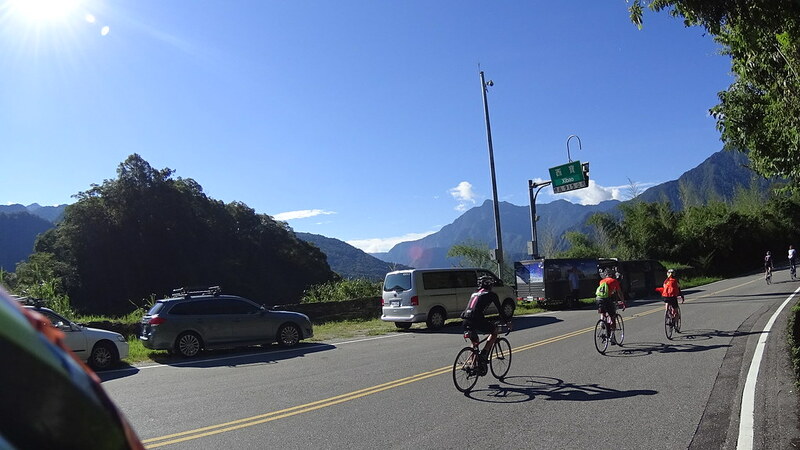 And such is one of the toughest climbs in the world, the Taroko (太魯閣) to Wuling (武嶺) through Highway 8 (台八線)/Highway 14 Jia (台十四甲線). 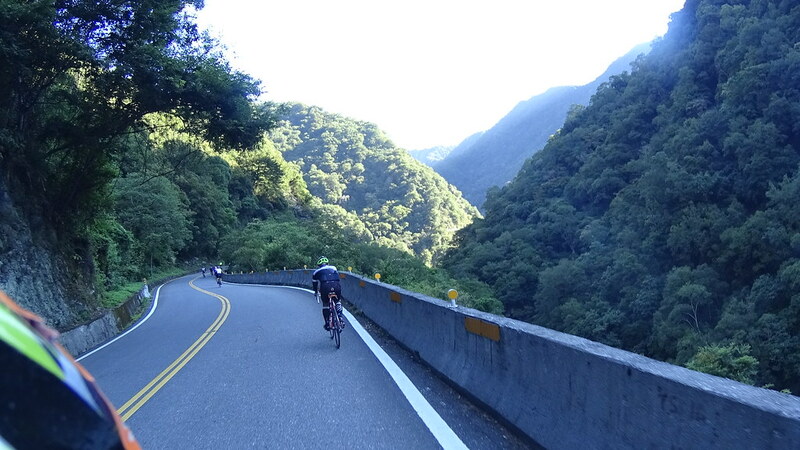 To Taiwan cyclists, conquering this route is considered as a must to transform from newbies to “serious” cyclists. 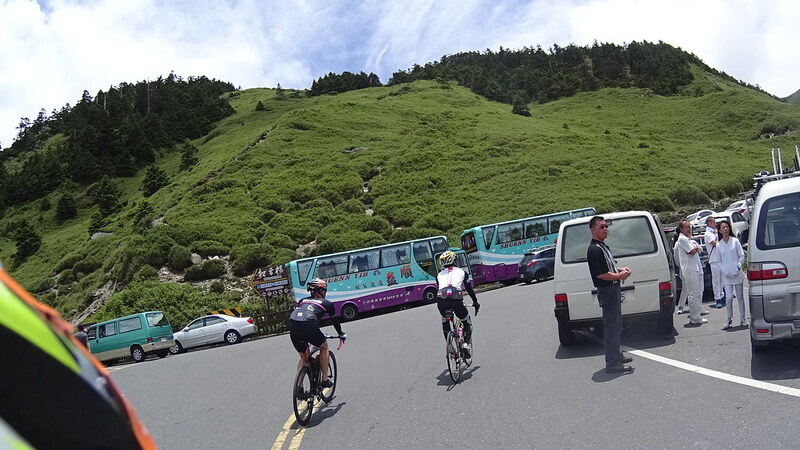 There are many organized events that ride this route. 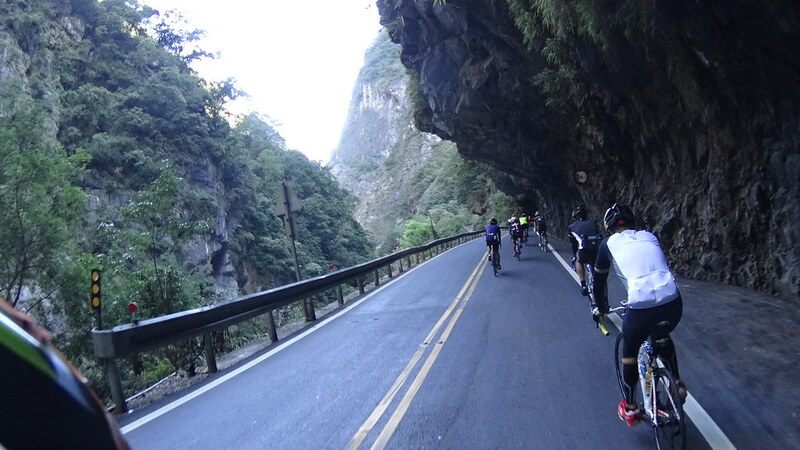 The one I joined is the 5th Maxxis Taroko Climb, a NEVERSTOP series with help from MAXXIS Tires. 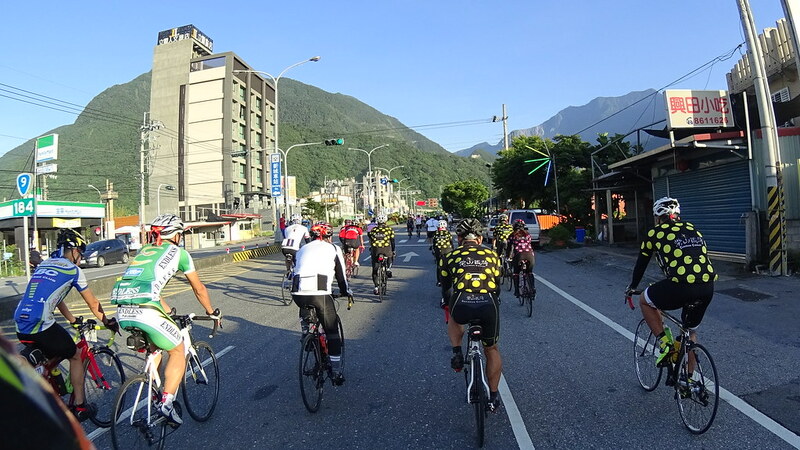 After a day of traveling from Taichung to Hualien, we started gather at Xiulin Junior High (秀林國中) at the starting line. 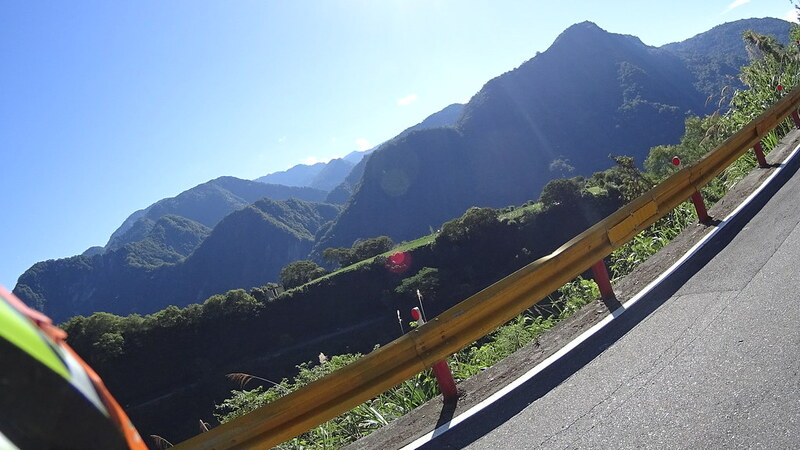 The weather was nice, and the morning views were wonderful. 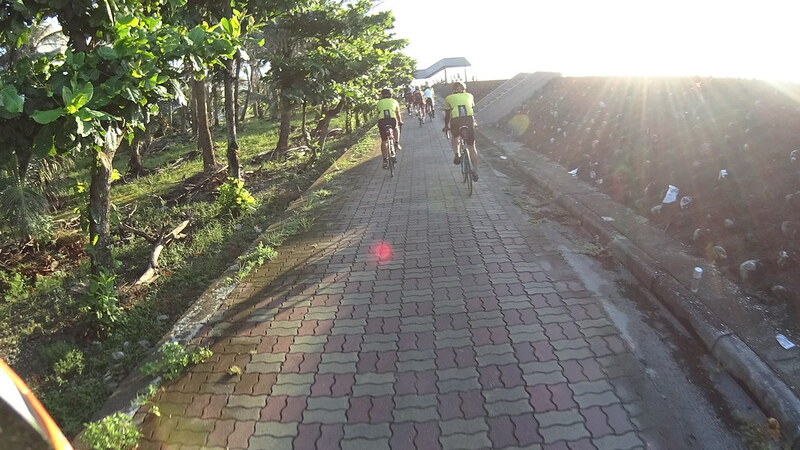 Ride along the shore bank. 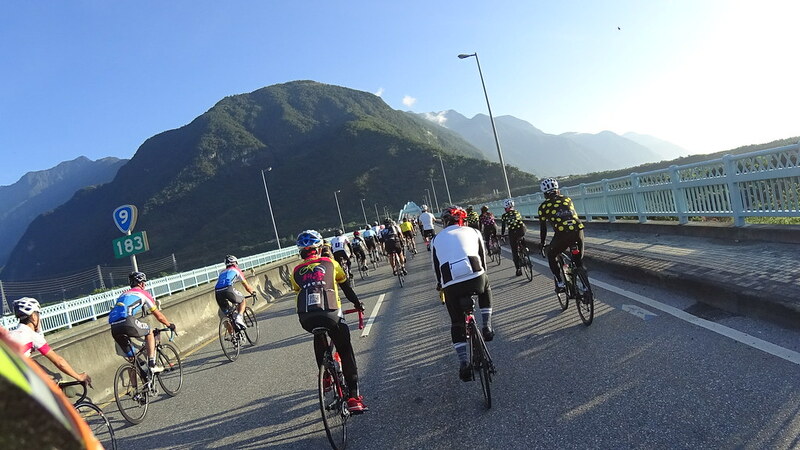 And the ride started. 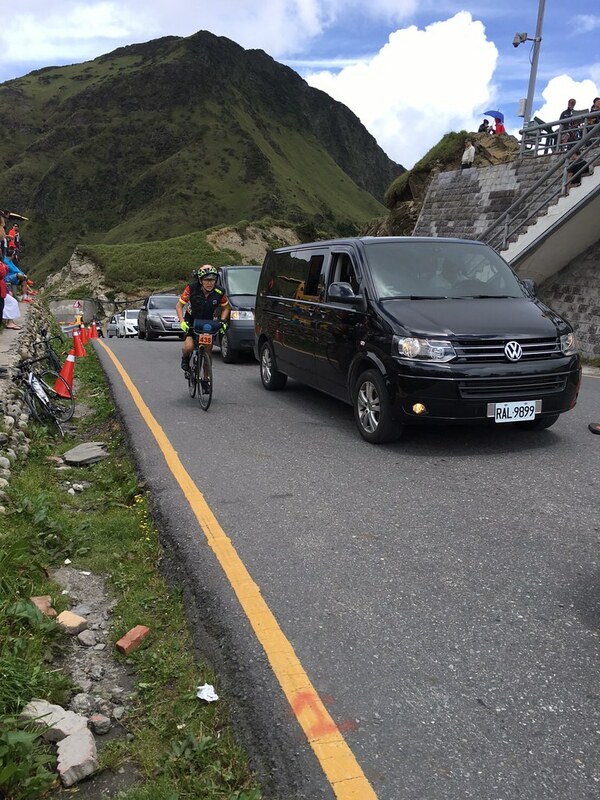 The first few km was led by the event vehicle to safely pass a truck-heavy section. 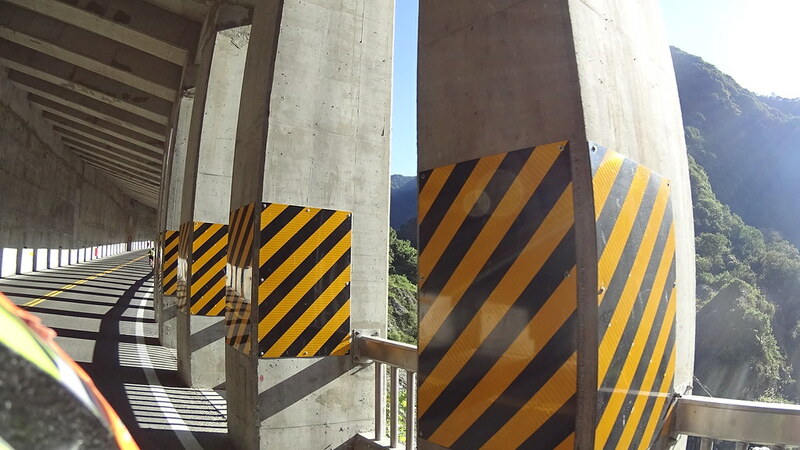 Trucks are common in this area for its high-quality marble stone/ceramics production. 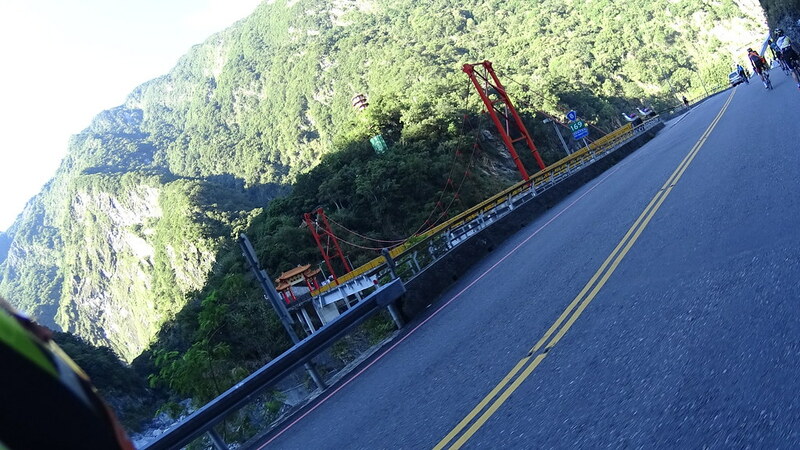 On the Great Taroko Bridge, part of the Su-Hua Highway (Highway 9), the only major highway that goes from Hualien to northern Taiwan. 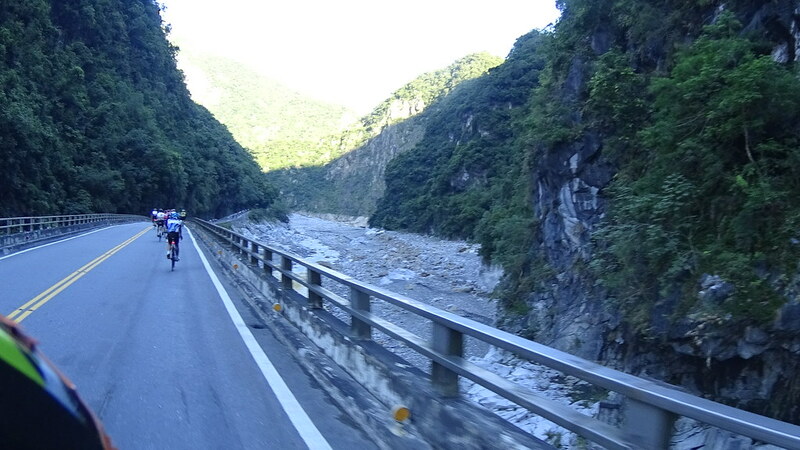 It crosses Liwu River (立霧溪) that carves out the great Taroko Gorge. 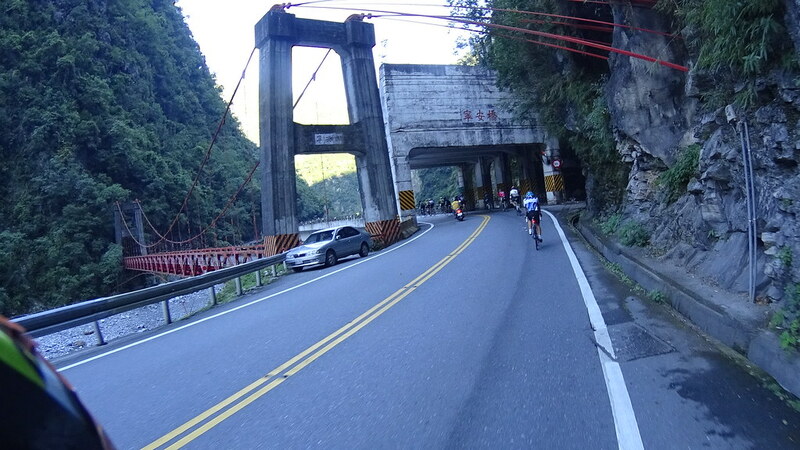 Once we passed the bridge we turned left to a by-road towards Taroko, avoiding big fat tourist buses at the entrance of Highway 8. 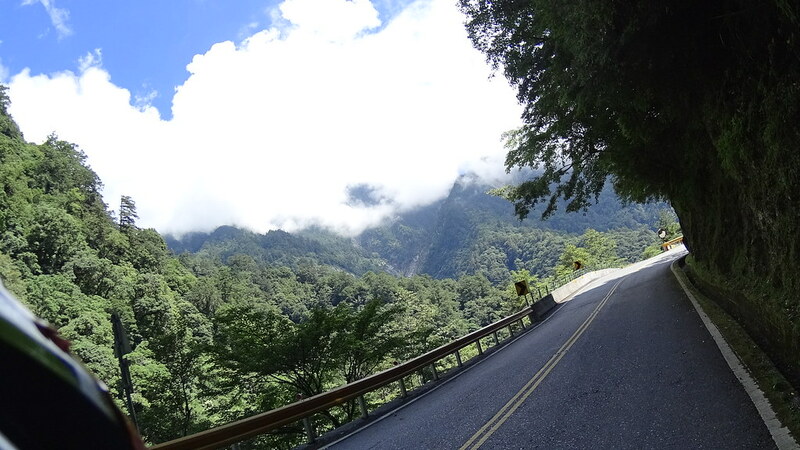 Switch to rural road and heading to Taroko. 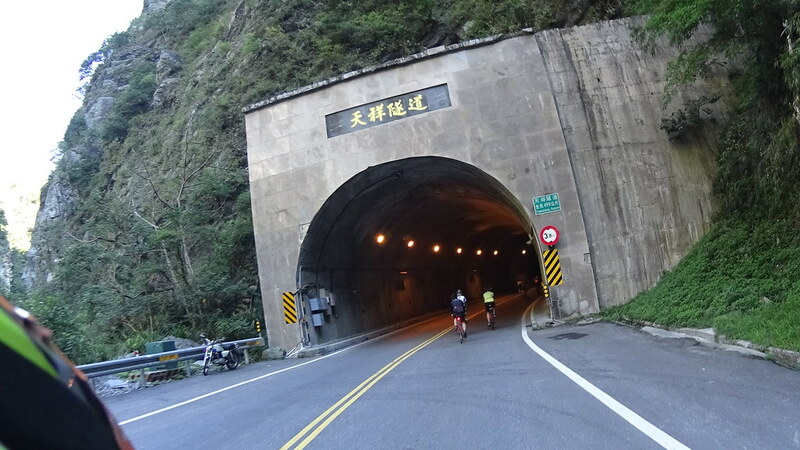 Entering ShaKaDang Tunnel, a bypass consisted of three tunnels parallel to Highway 8 to avoid big tourist buses. 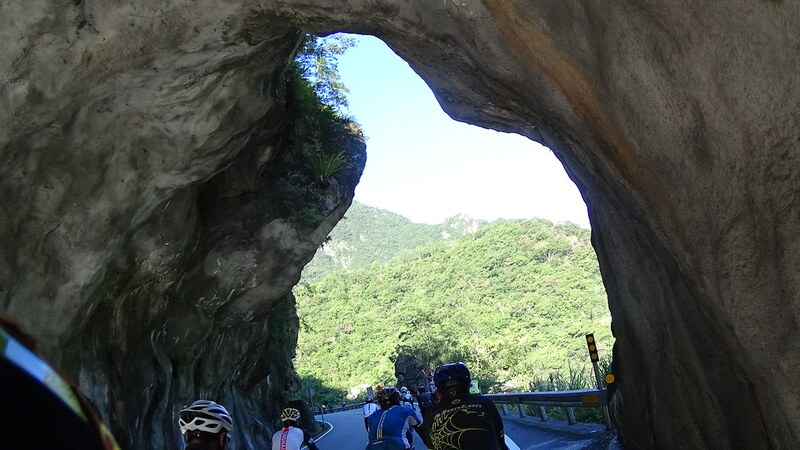 Tunnels in Taroko National Park were well lit. 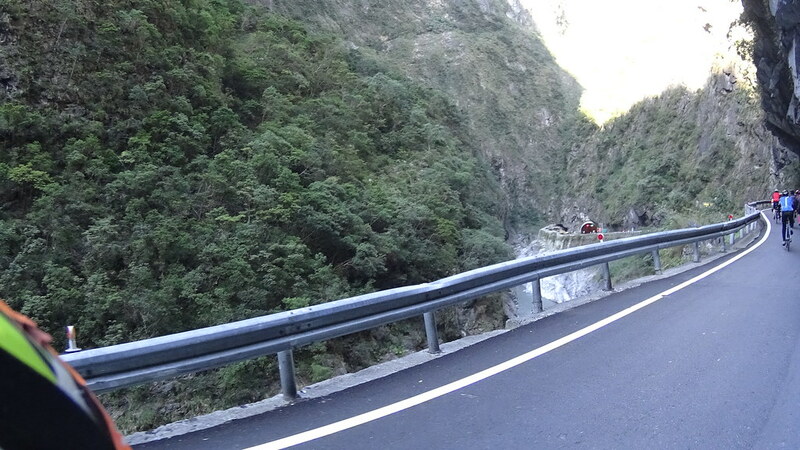 Once we passed the three tennels we were back on Highway 8, greeted with majestic cliffs of Taroko Gorge. 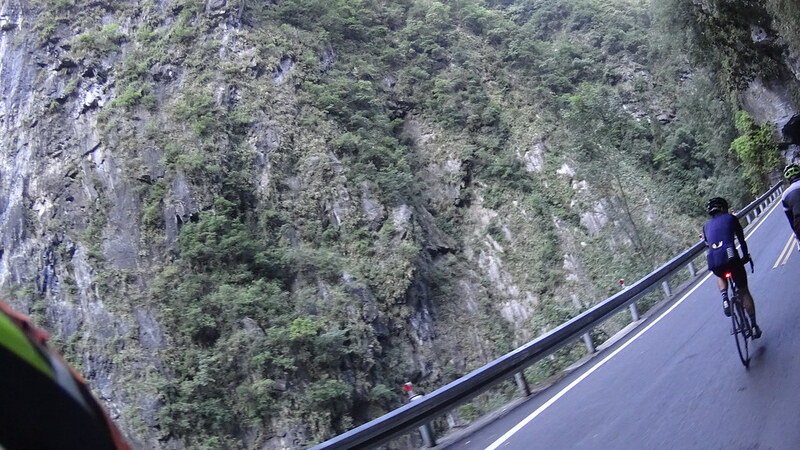 River constantly carving the gorge. 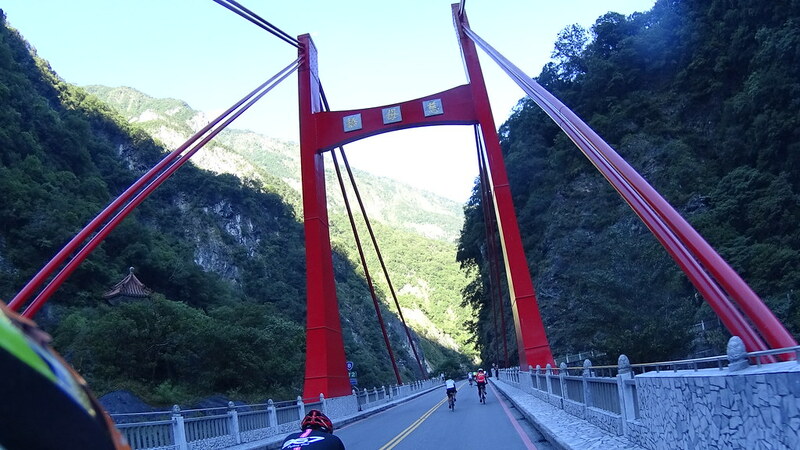 There were many bridges along the way. 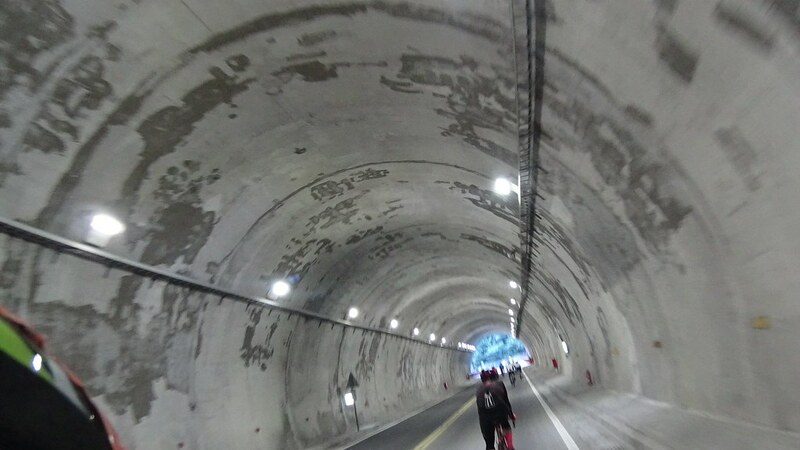 Some were damaged before, defunct, and led to nowhere. 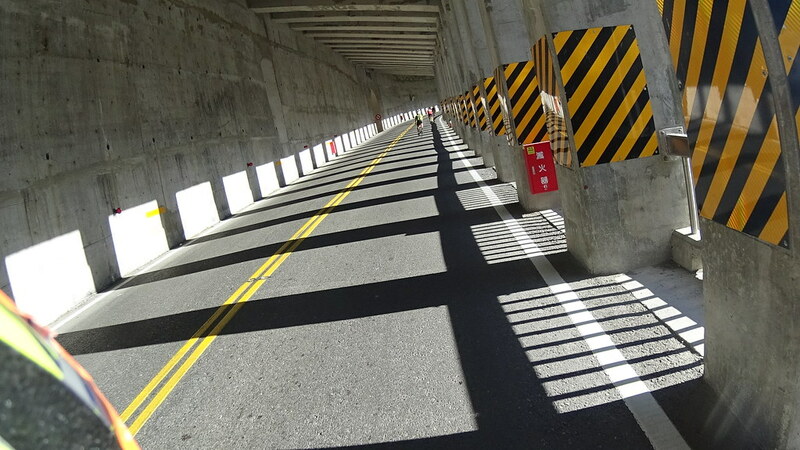 As if the walls were closing in. 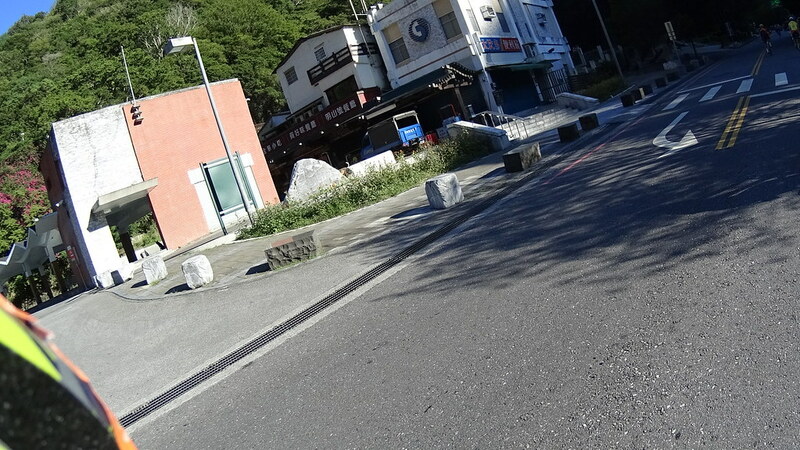 Notice the super-white stones at the river bank. 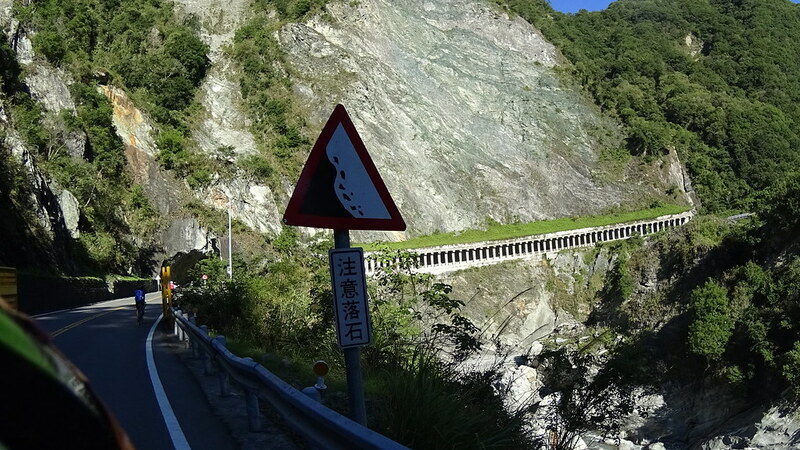 Those were the famous Taroko white marbles. 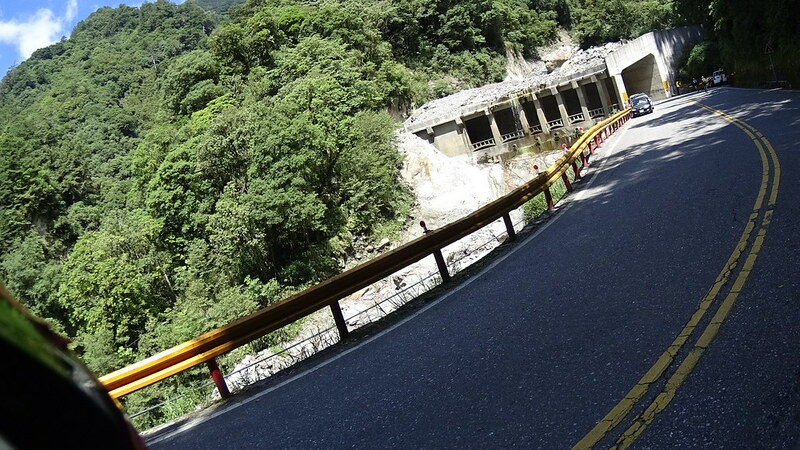 Once passing the Kind Mother Bridge and a long TianXiang (天祥) tunnel, comes the first major recreational area of Taroko National Park: TianXiang. 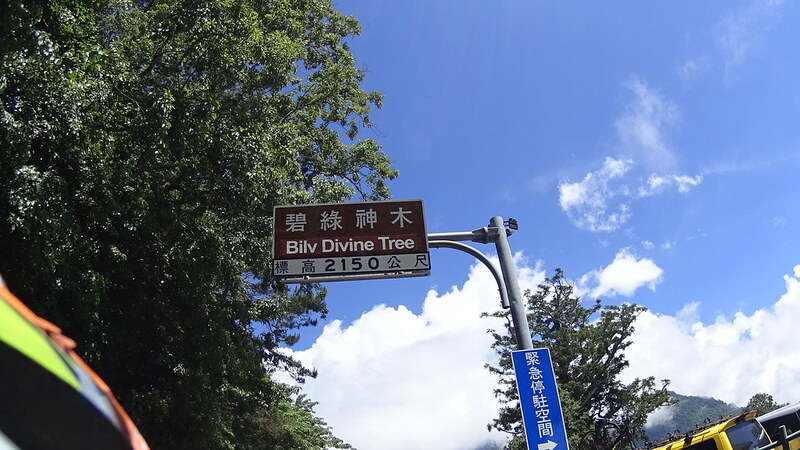 It has a big 5-star hotel, a China Youth Corps (this weird name came from the old KMT era. 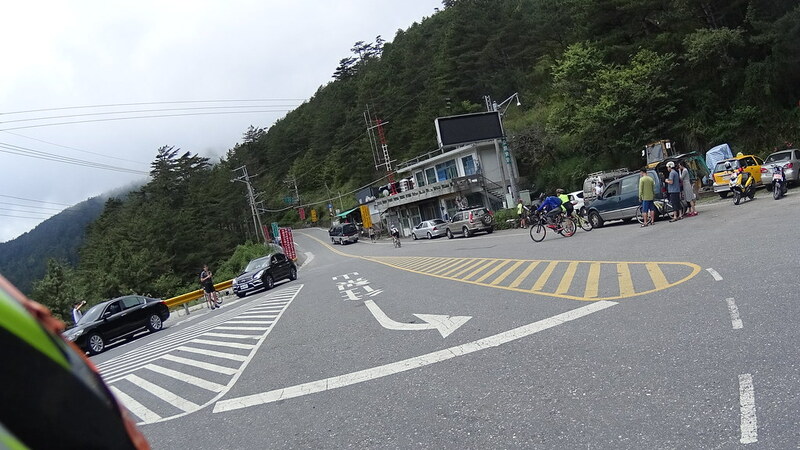 It’s a non-profit hostel), police station, post office, and a telecom office. 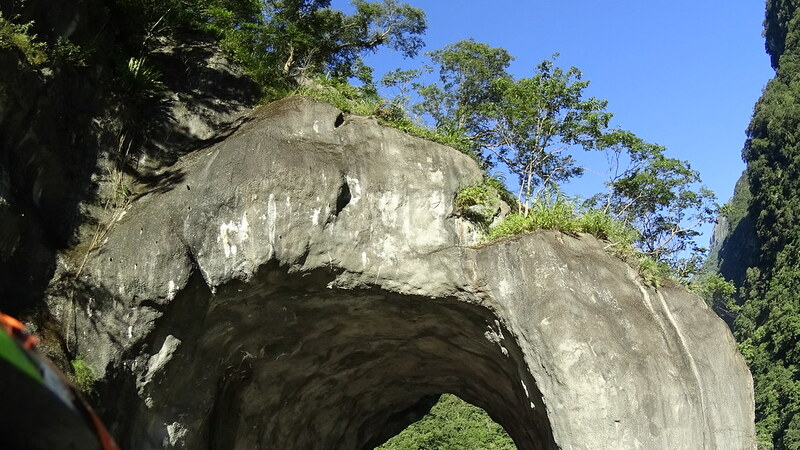 Nearby is a crazy temple built next to the cliff. 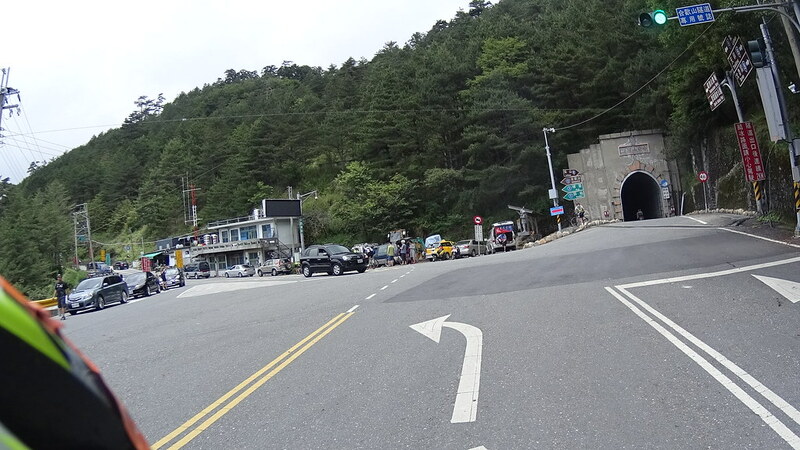 The left building is the telecom office, right the post office. 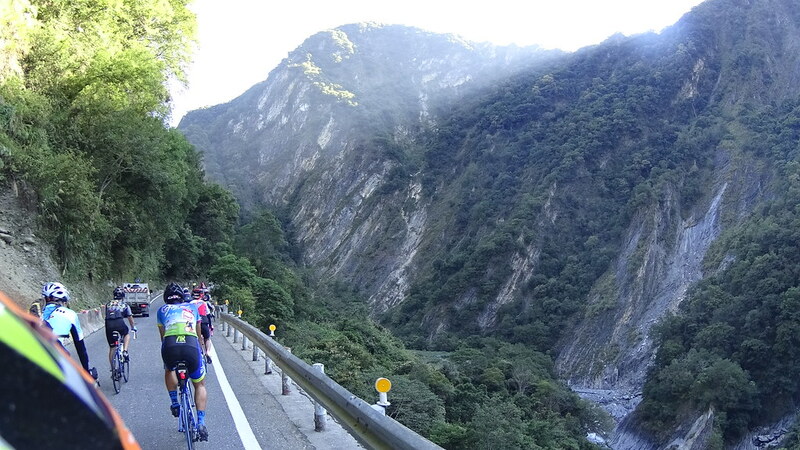 After TianXiang the road started to rise, replacing gorge view with typical Taiwan mountain view. 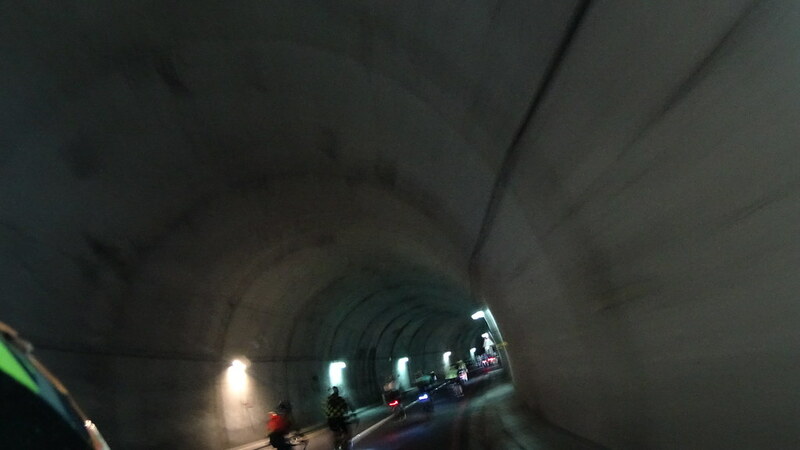 The last wonder is this massive wall with a long open tunnel. 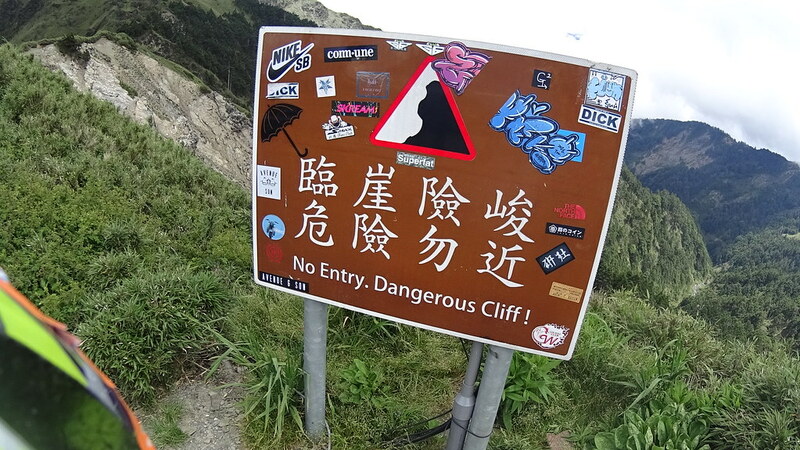 This used to be a massive slide area. 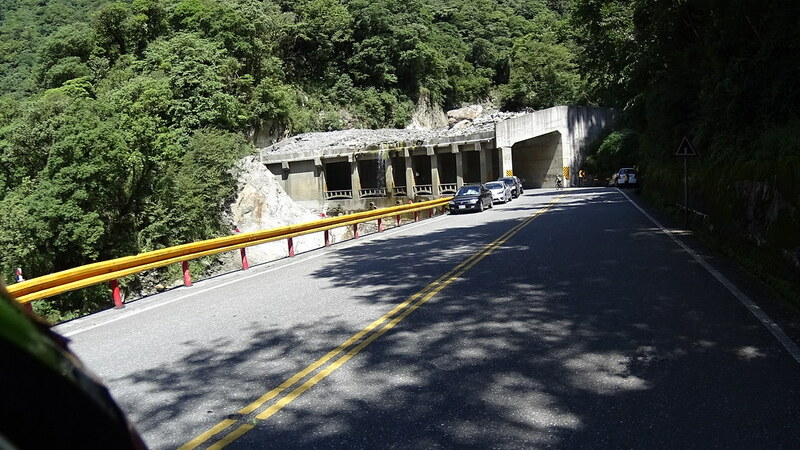 After the slide the old road was replaced by a tunnel going beneath the debris. 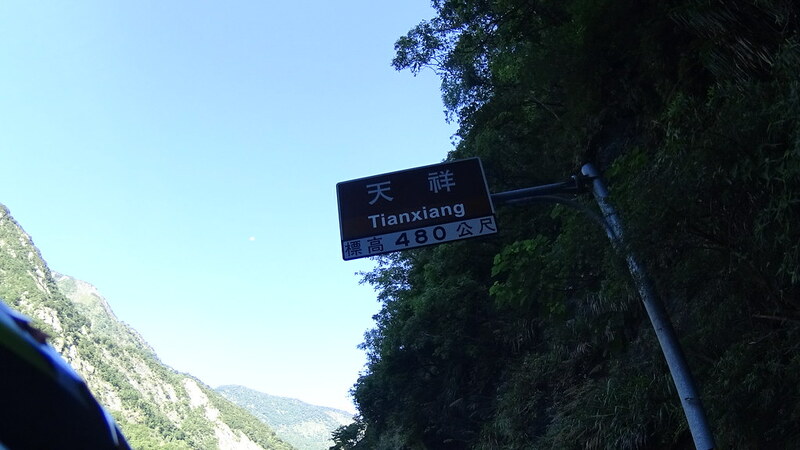 The sign said “Xibao” (西寶). 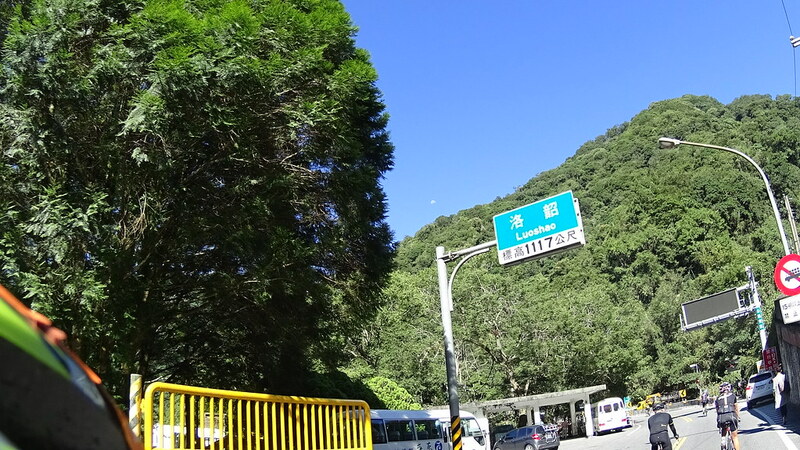 There was a side road that leads to one of the few elementary school in Taroko National Park, the Xibao Elementary School. 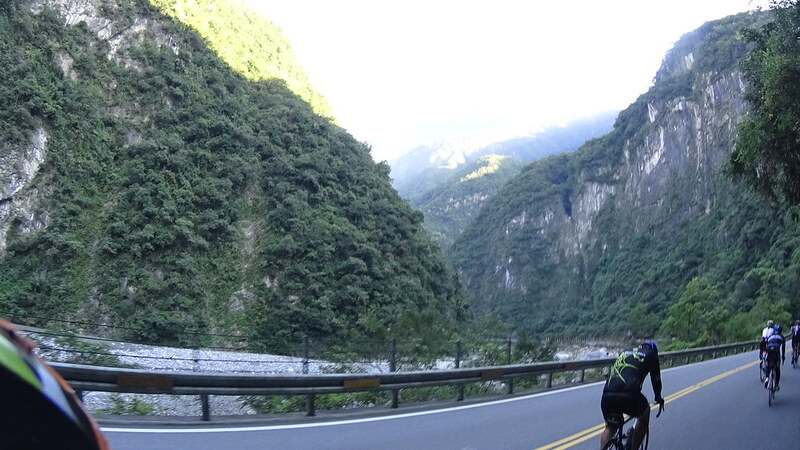 Passing XiBao, one continully enjoyed the mountain views of Taroko National Park while paddled against the gravity. 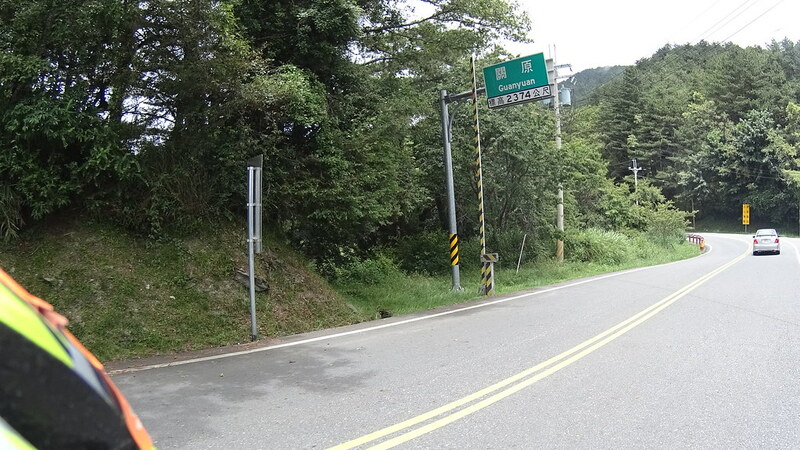 No site of buildings until the next checkpoint, LuoShao (洛紹), at 1117 meter. 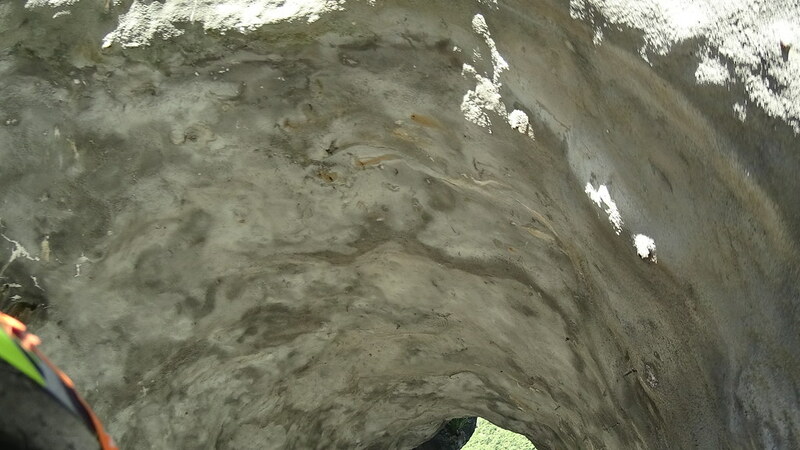 A big massive rock waiting for gravity and rains to do the work. 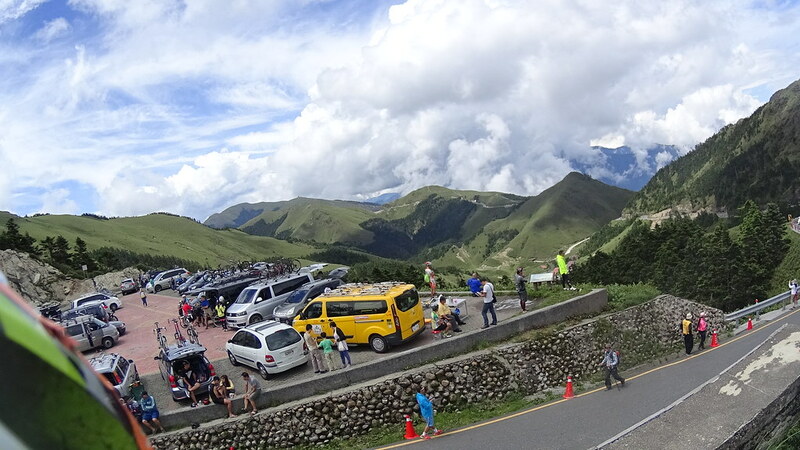 There was a reststop at SinBaiYang (新白楊) at about 1500 meter elevation. 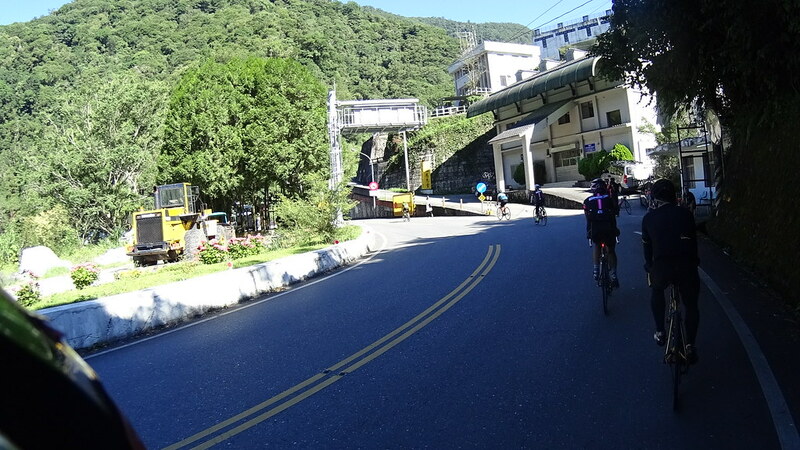 Since I was trying to stay on to my schedule (arrive GuanYuan (關原) before noon) I didn’t bother to linger there and take photos. 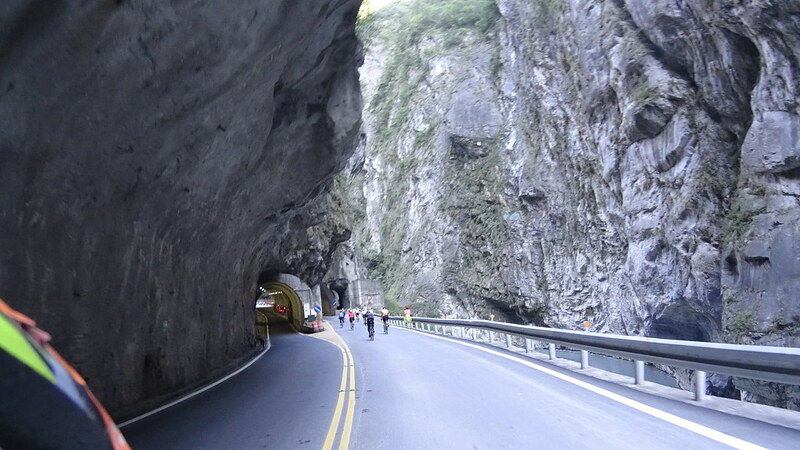 An open tunnel that withstood landslides. 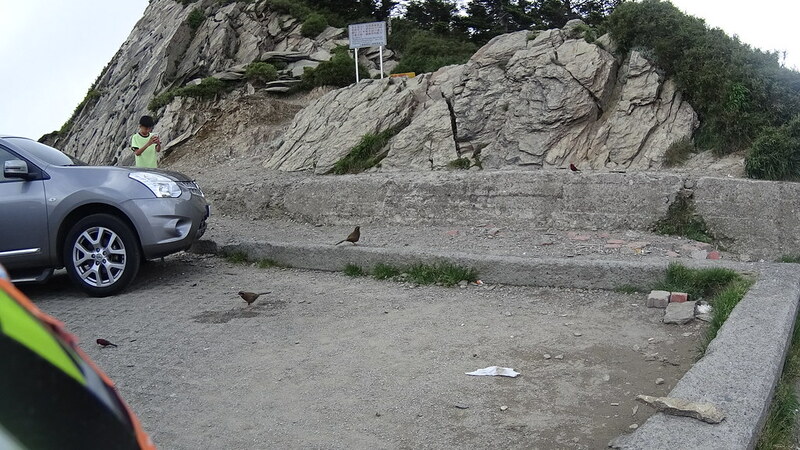 Now there is creek flowing above. 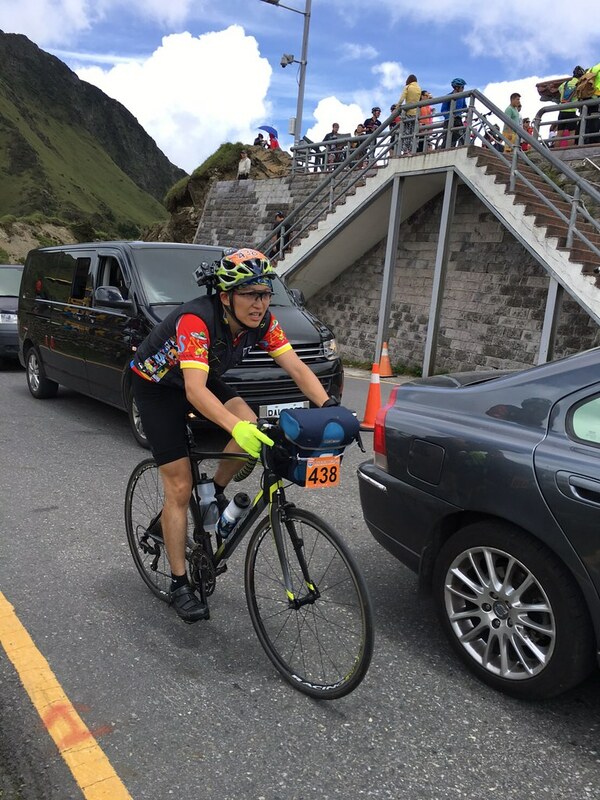 Passing the 2000 meter mark! 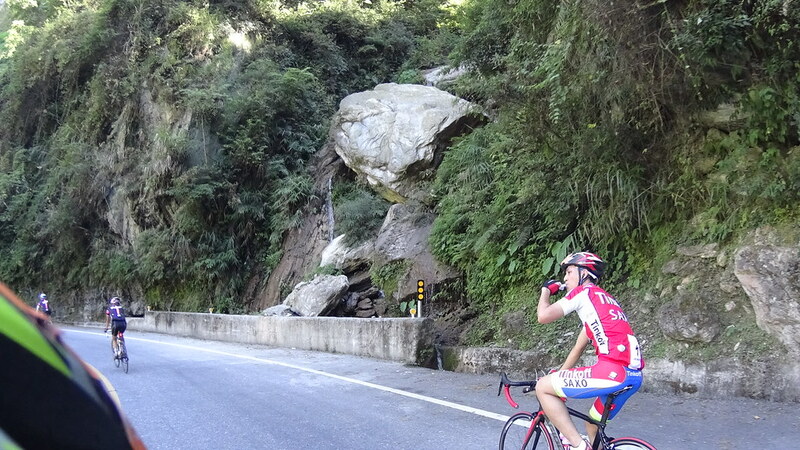 Not far away from the Divine Tree came the major checkpoint of the ride: GuanYuan (關原) at 74 km mark with 2374m elevation. 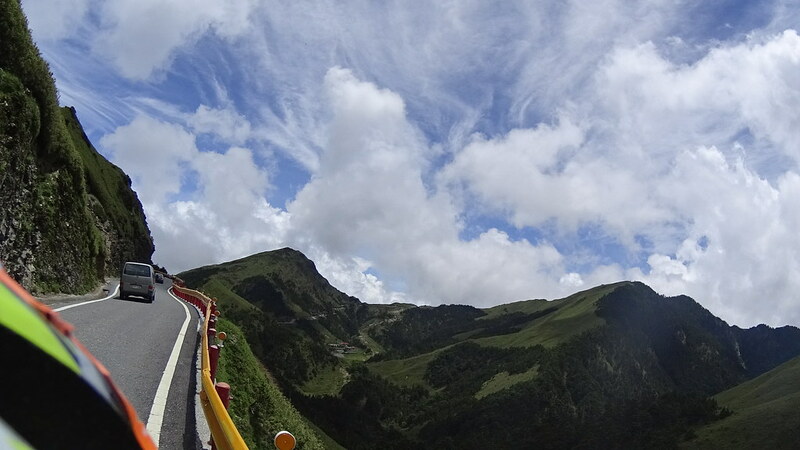 It has the highest gas station in Taiwan. 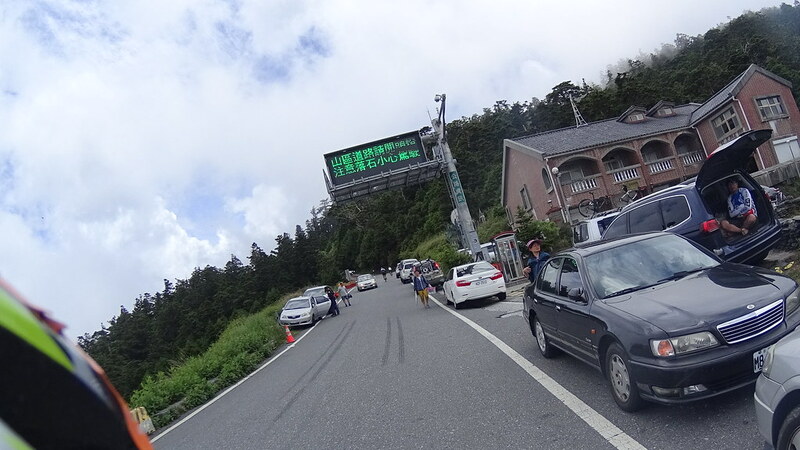 I was doing great in terms of time, arriving here in 5:10. 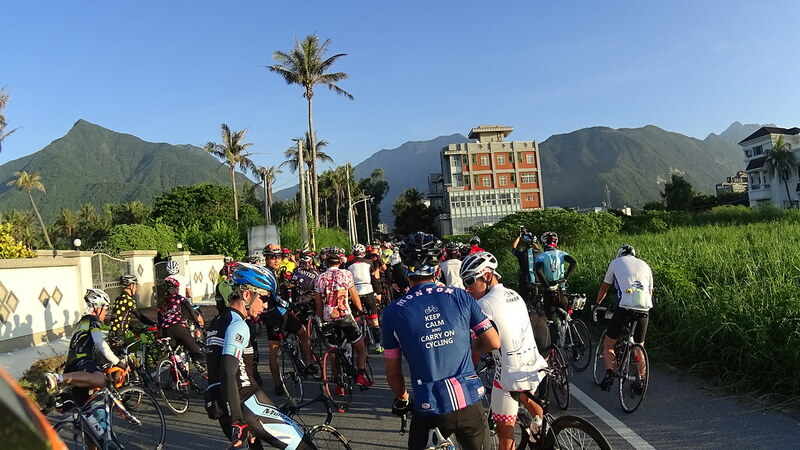 One of the great things of Taiwan cycling event is the good food. 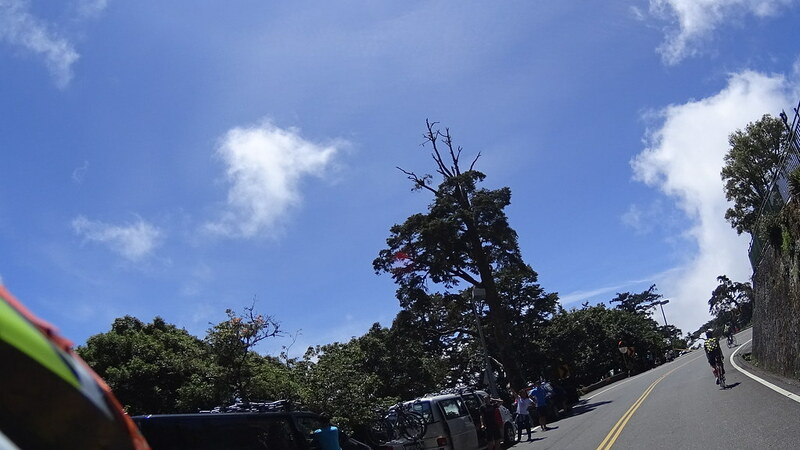 Here I enjoyed hot pork ball & bamboo soup (貢丸竹筍湯) and a lot of bananas. 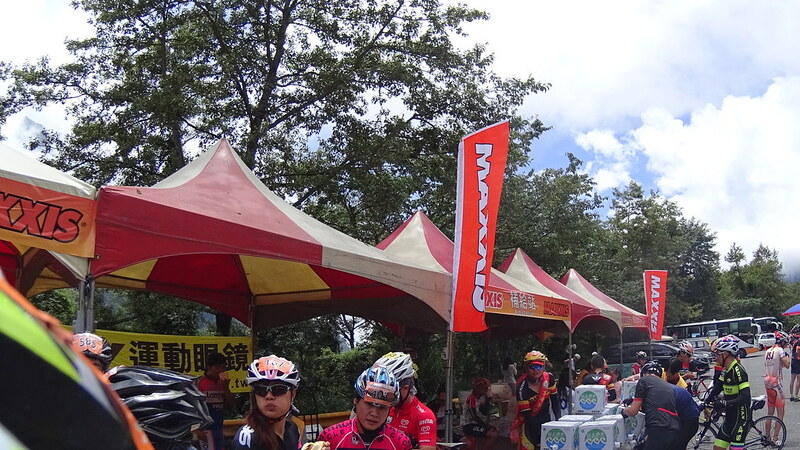 The torch is China Oil’s (中油) symbol. 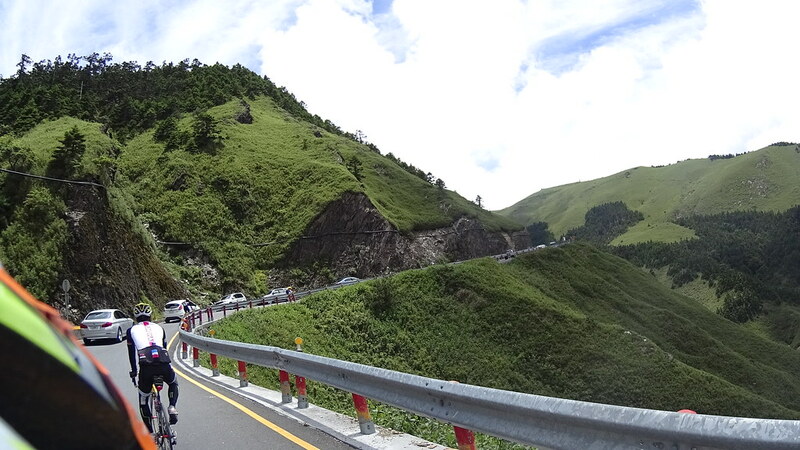 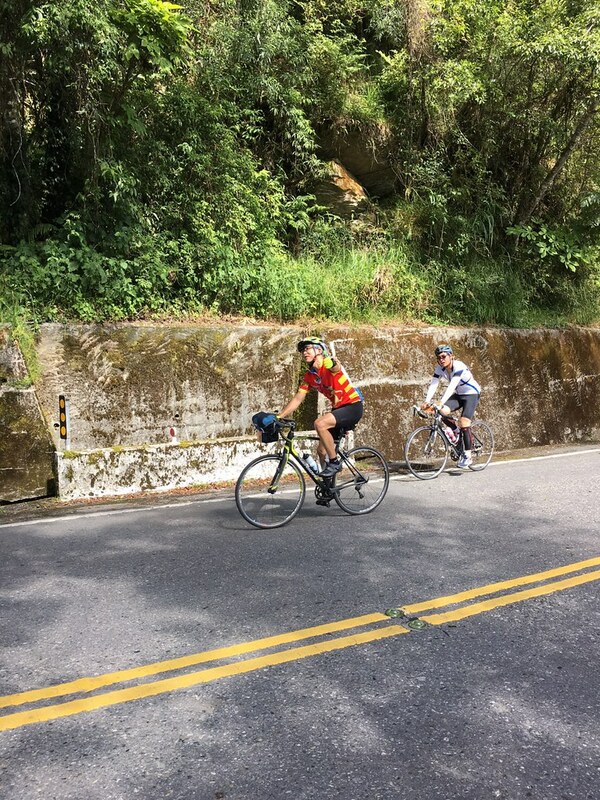 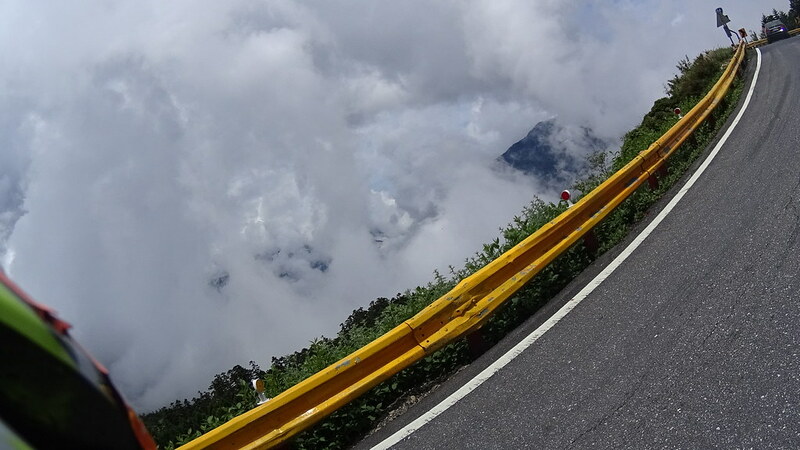 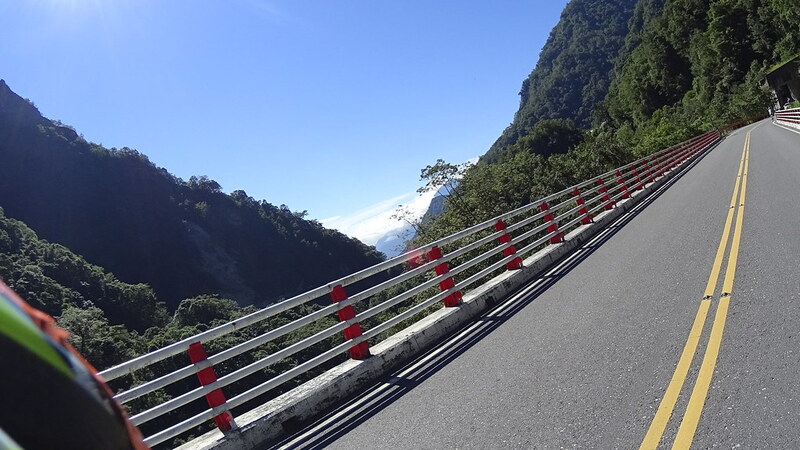 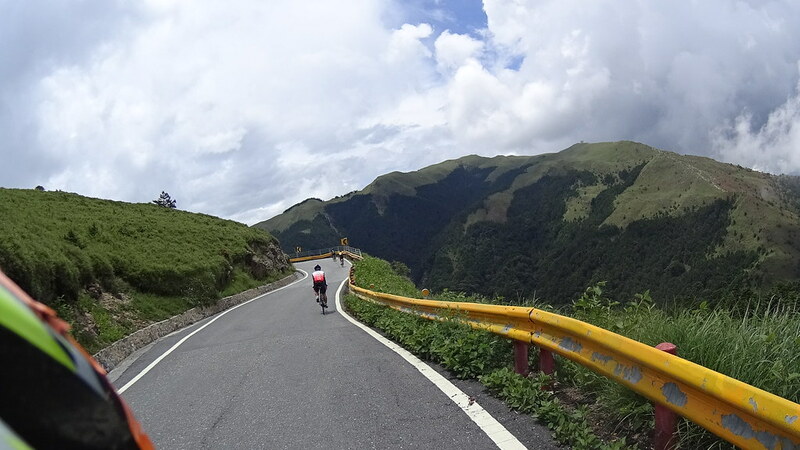 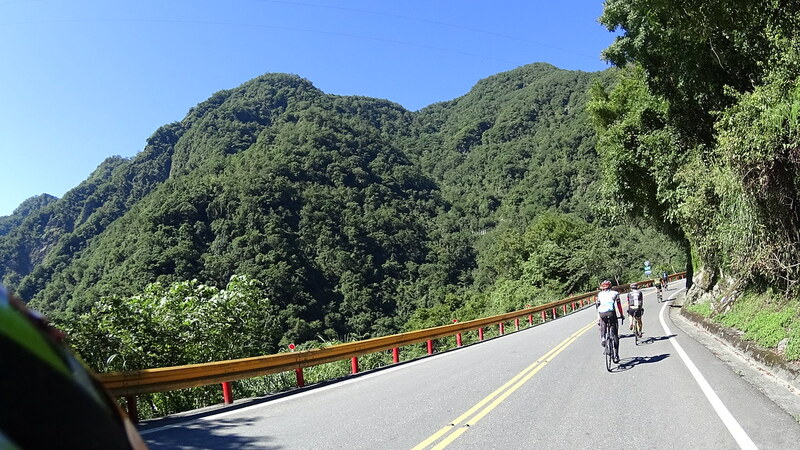 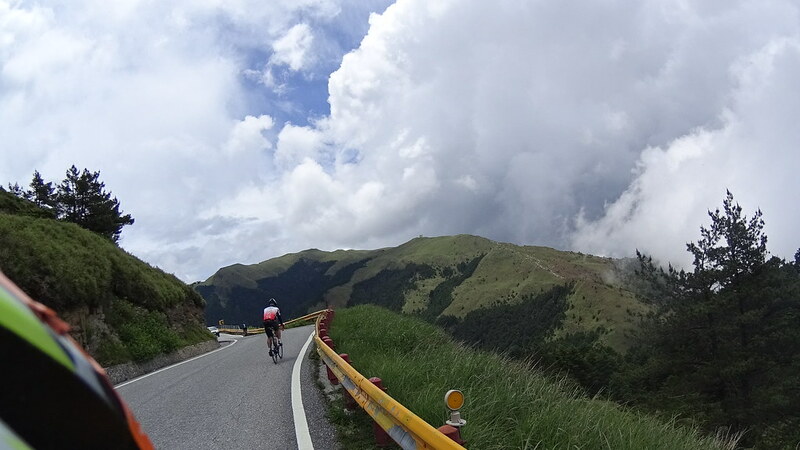 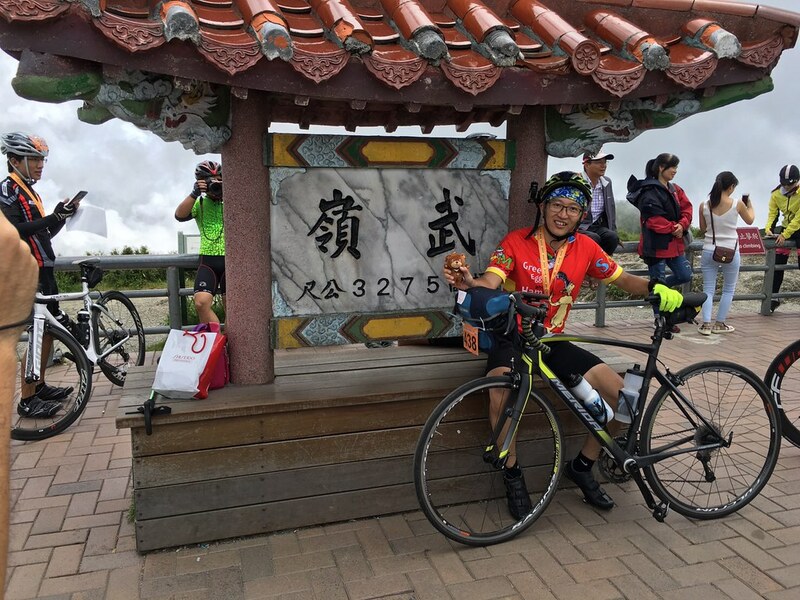 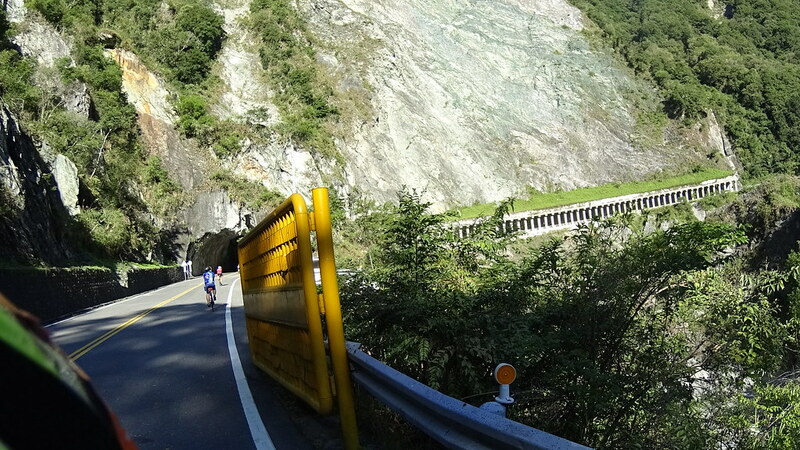 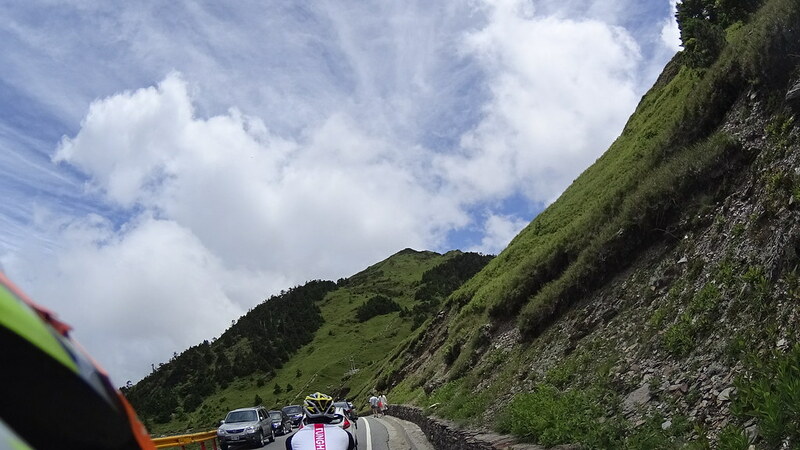 Starting from GuanYuan, the last 15km road is what Taiwan cyclists called “The Heaven Road”, or “The Wall”. 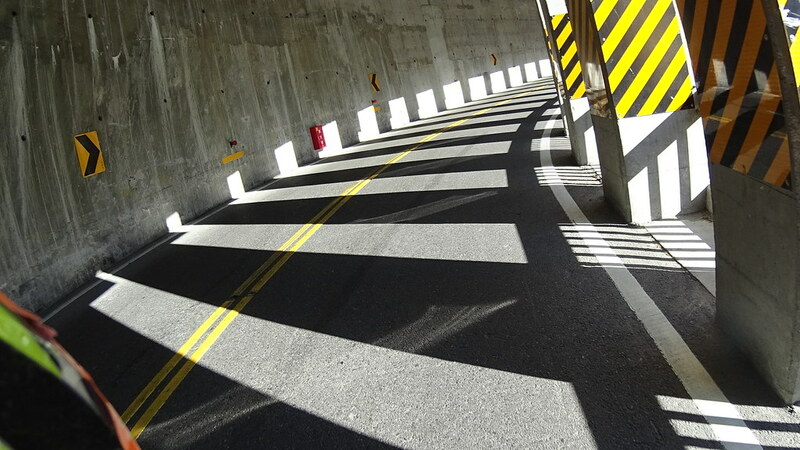 A simple math told you that the average gradient is above 9%, but don’t be fooled by it. 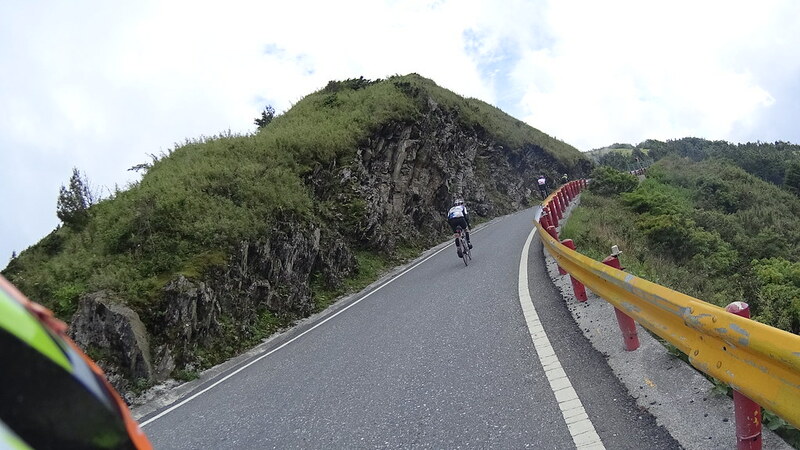 The road went through a saddle point on top, so there was quite a section that was flat and downhill. 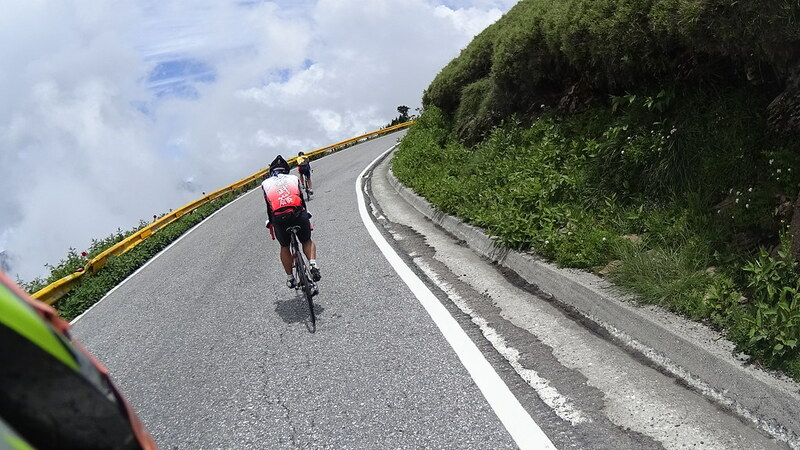 This made the other section even steeper. 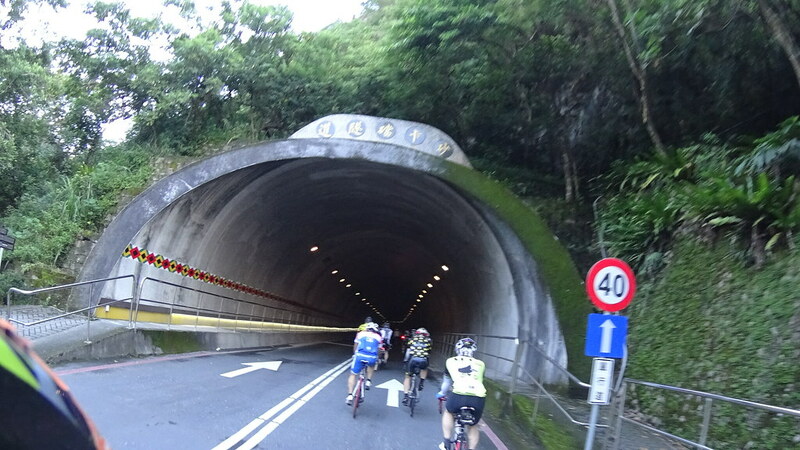 The real climb started from DaYuLing (大禹嶺), a 3-road intersection which Highway 8 entered a tunnel toward the Pear Mountain (梨山), an area famous for Taiwan high attitude fruit production. 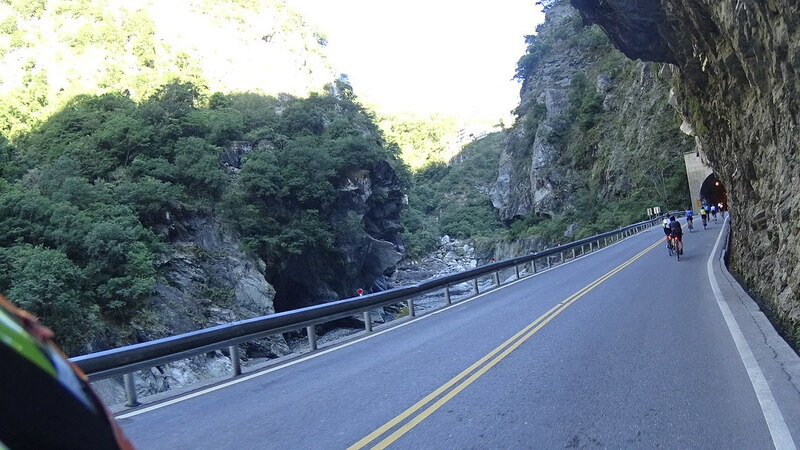 The other road was Highway 14 Jia, the road to Wuling, our final destination. 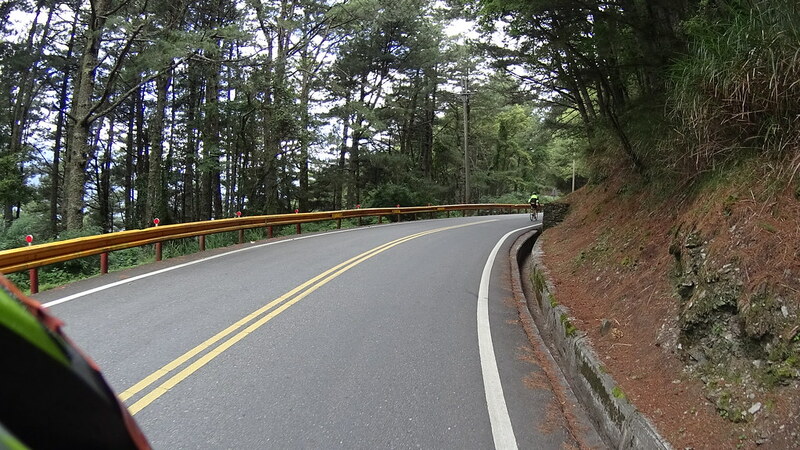 The Heaven Road consists of 4 main sections. 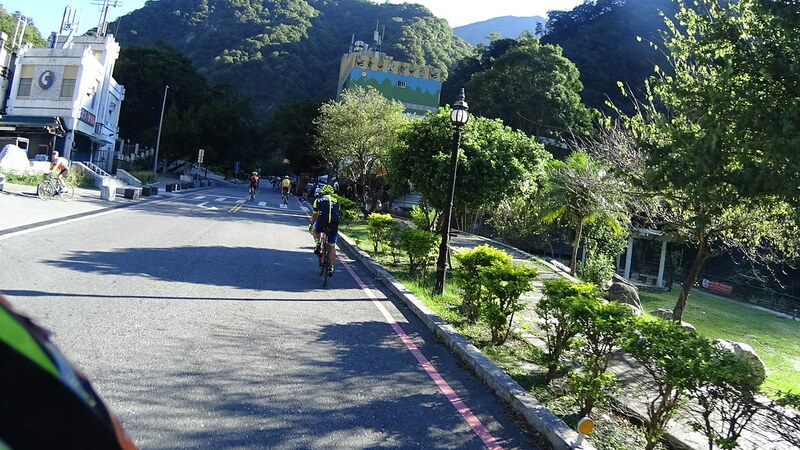 The first is the unforgiving 8km long climb from DaYuLing to Mt. 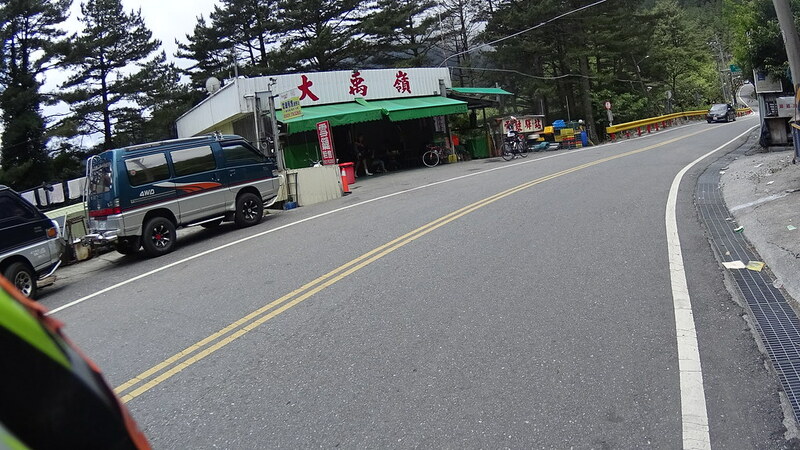 Hehuan Service Station (合歡山管理站). 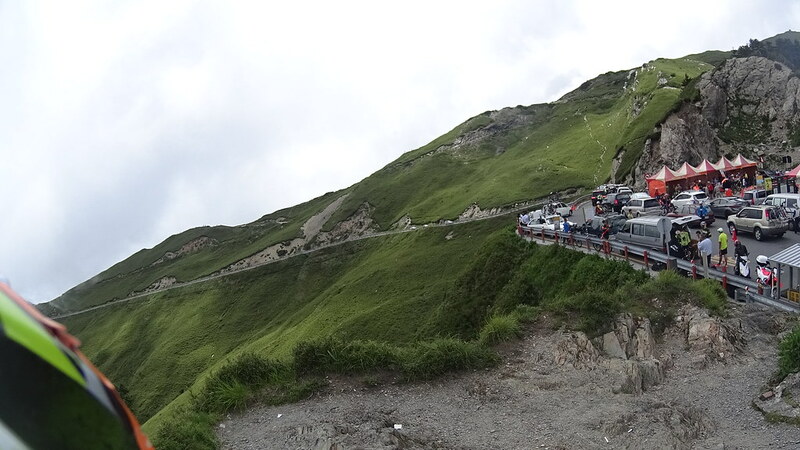 There were 3 or 4 switch backs with grade probably over 20%, and the rest probably linger around 10-15%. 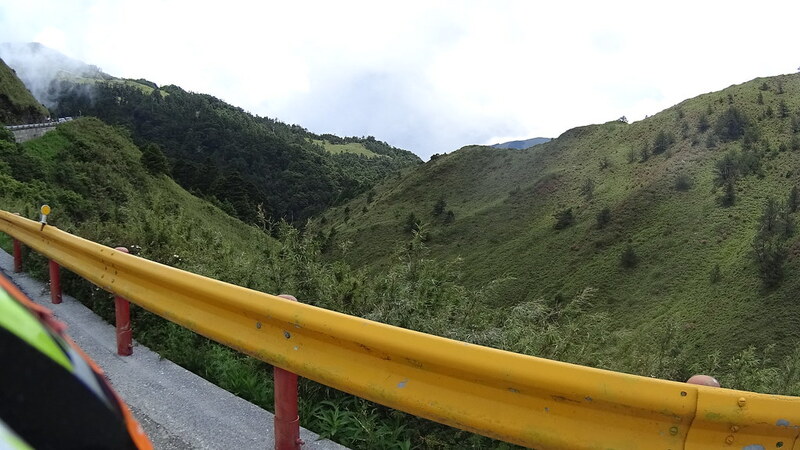 At about 2900 th road crossed over a saddle point, showing the first site of ridgeline. 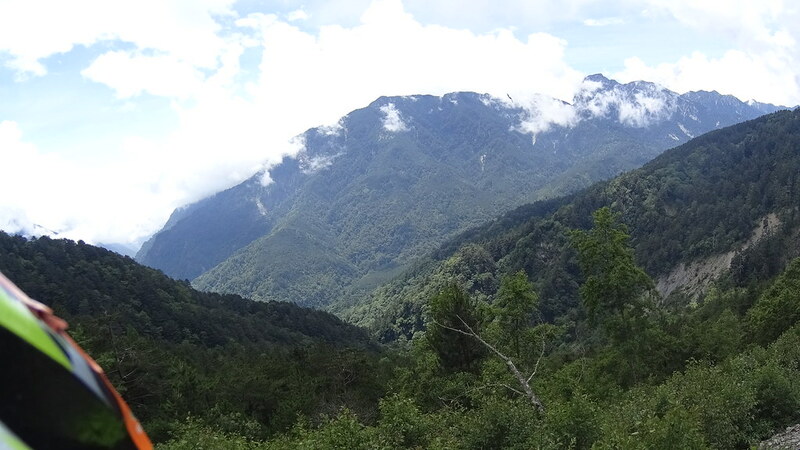 Here forest starts to disappear and is replaced by high mountain meadows. 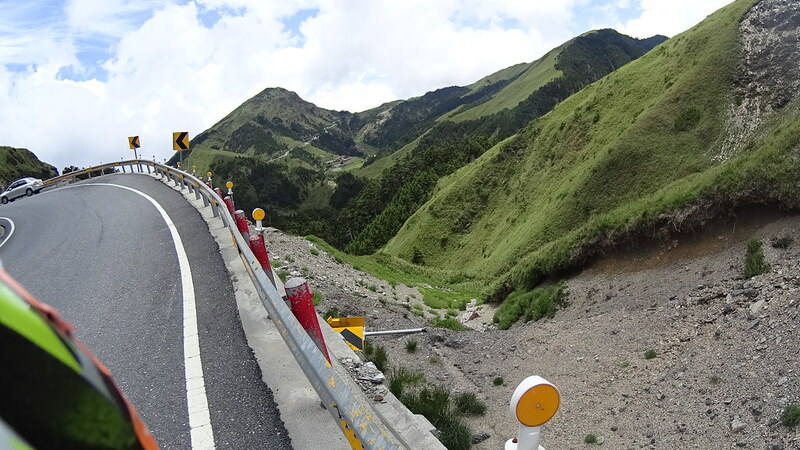 The second section of the Heaven Road is from the Service Station to another saddle point called “Big Wind Gap” (大風口), about 2km. 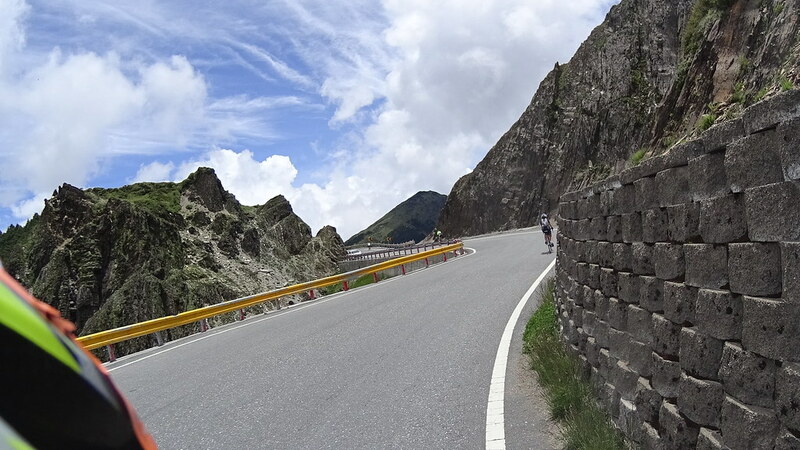 Here there was a big switch-back, and the road continued go up to near 3200m elevation. 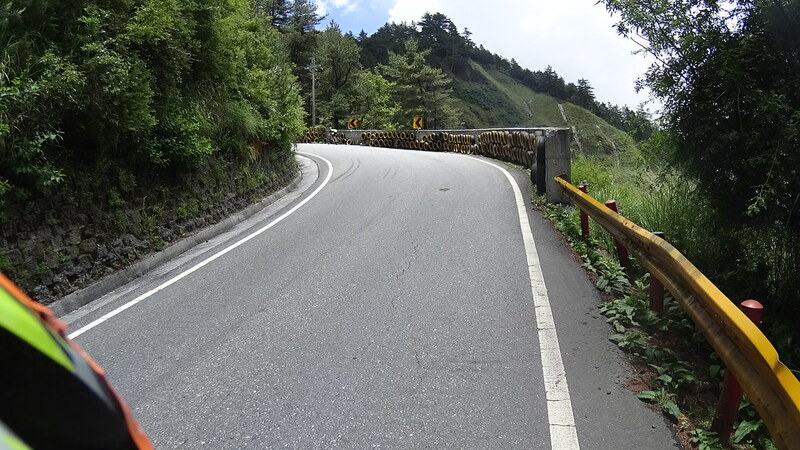 After this was a steep downhill to the highest hotel in Taroko, the SongShueLou (松雪樓). 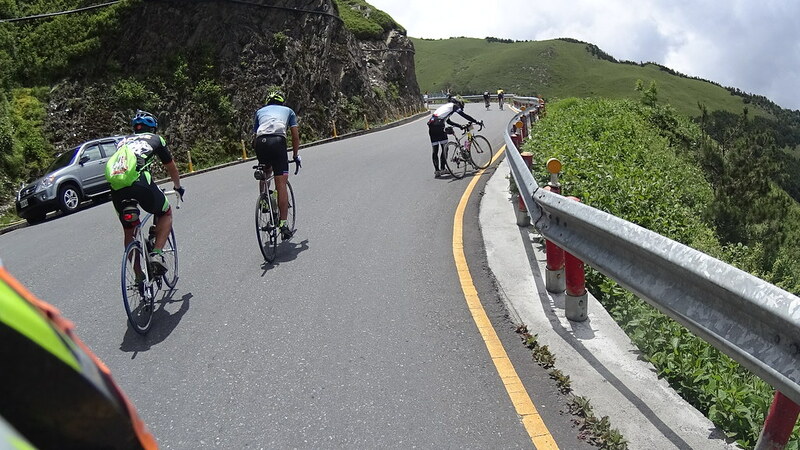 A short rest before the final steep climb. 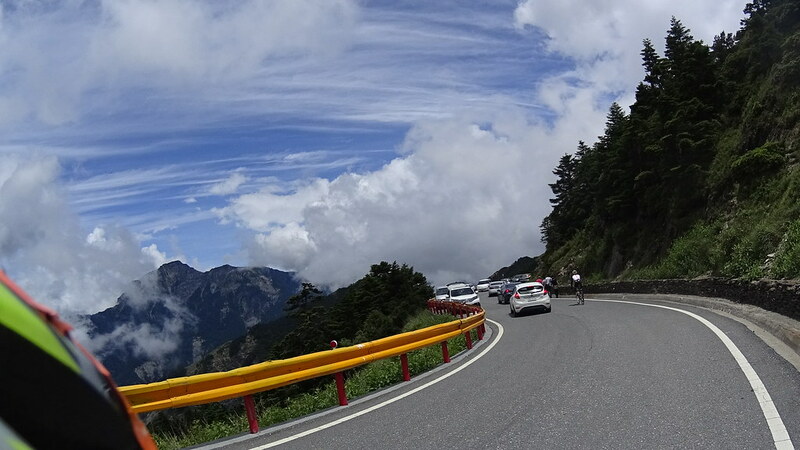 The final stretch of the Heaven Road was a 1.5km climb to Wuling along Mt. 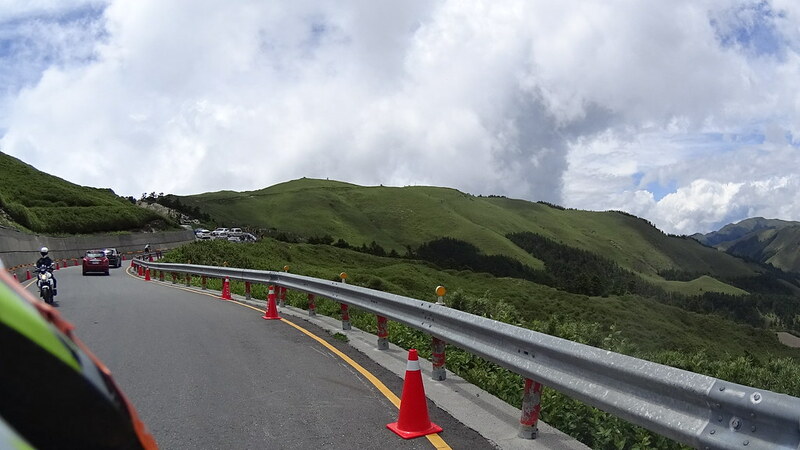 Hehuan east peak towards the main peak. 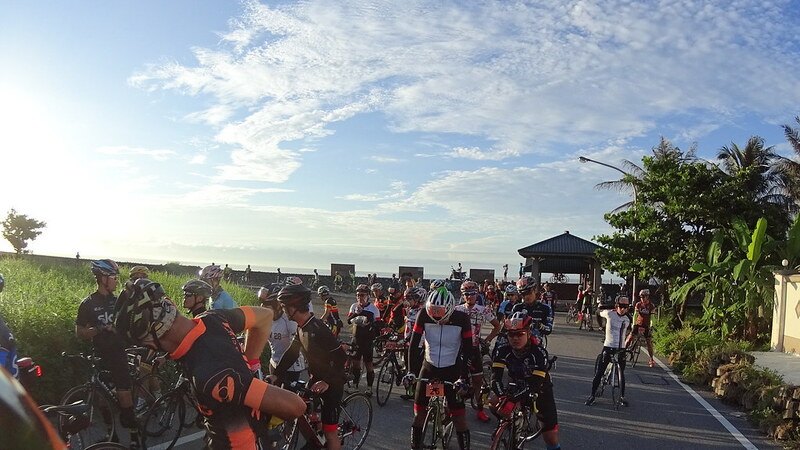 The last sprint. 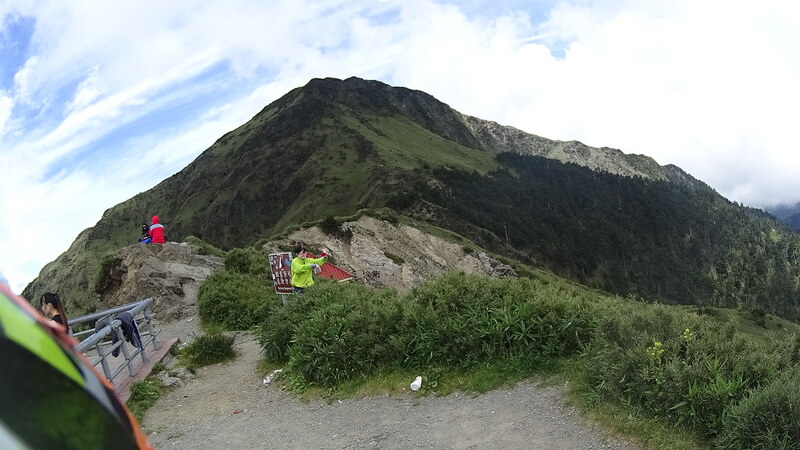 The background is Mt. 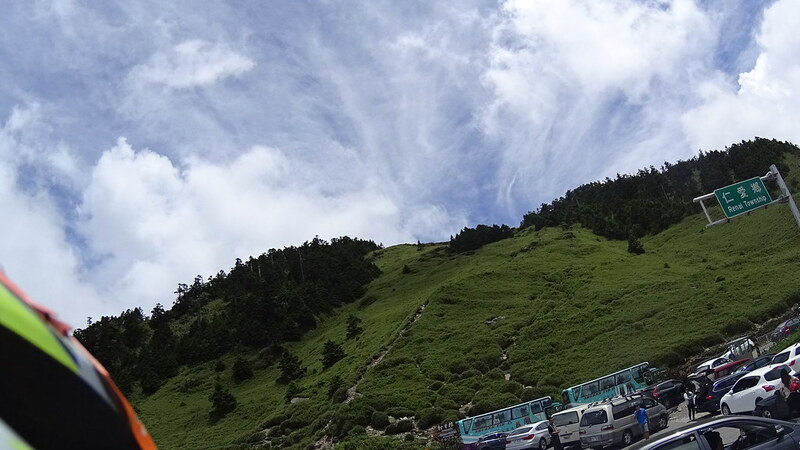 Hehuan East Peak. 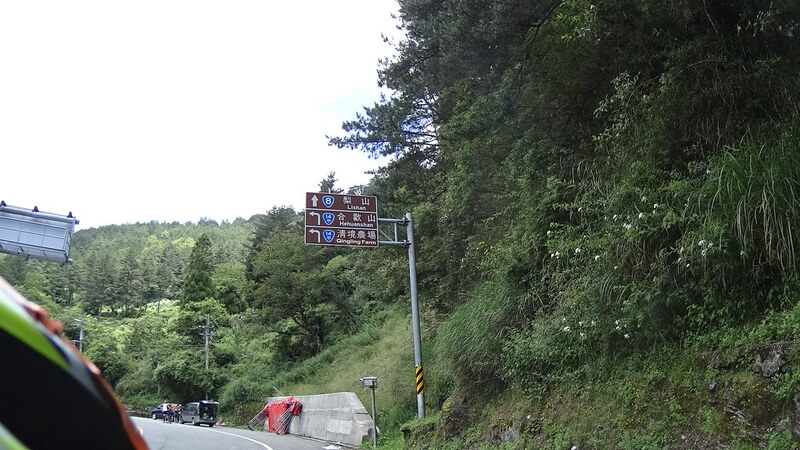 Arrived. 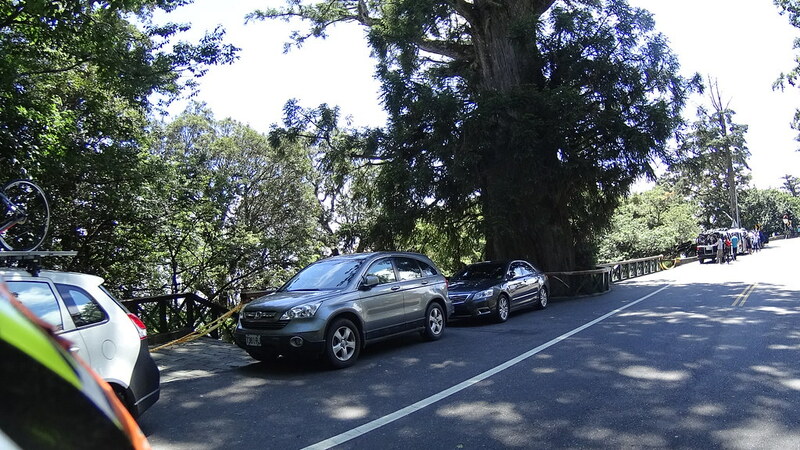 Too many cars here to look cool. 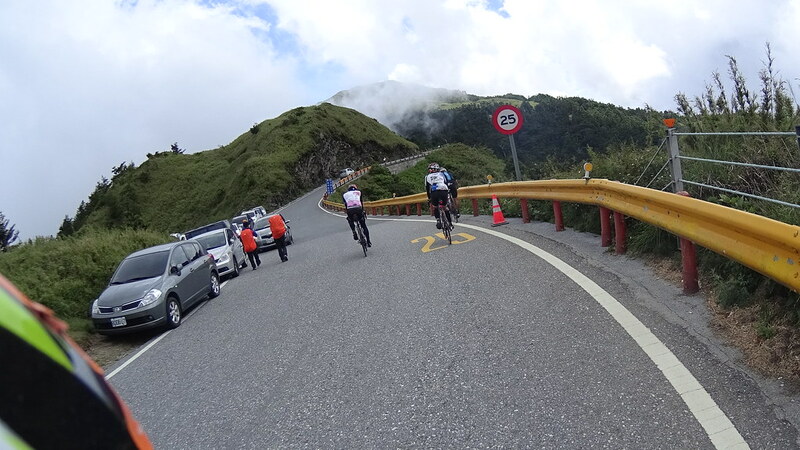 Thw Wuling Symbol, 3275 meter. 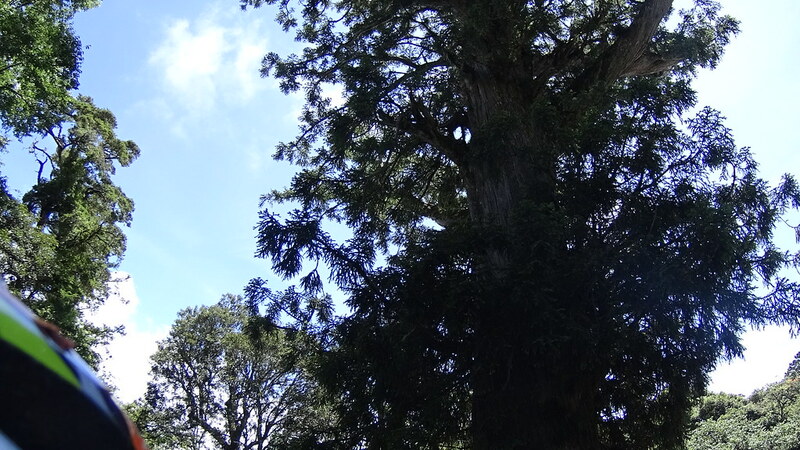 View from the West side. 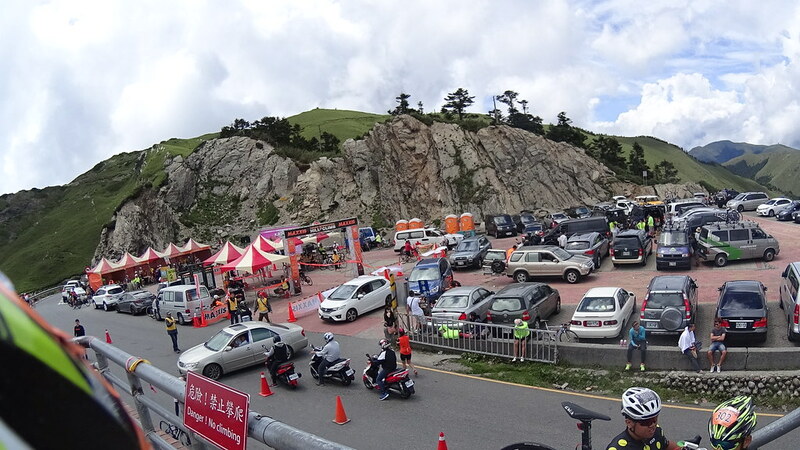 There were also many ride events that go to Wuling from the West vis Highway 14 Jia. 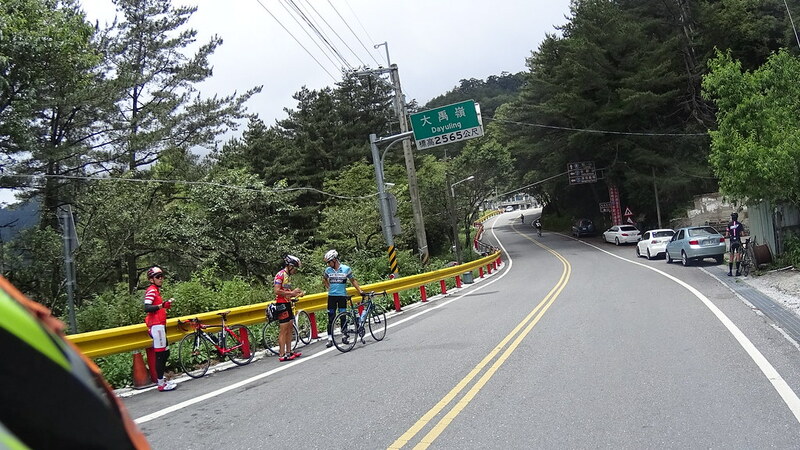 It was shorter, and the total elevation is lower. 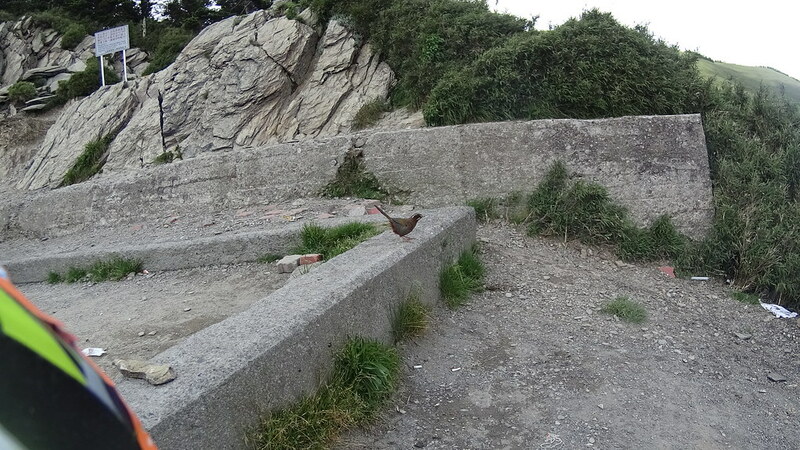 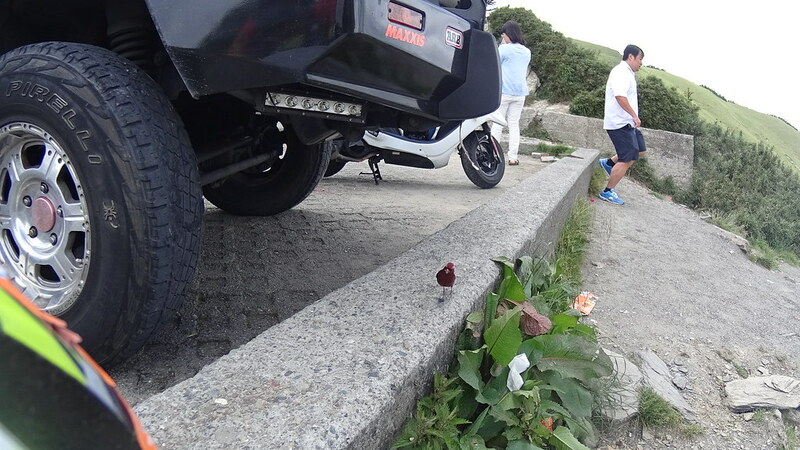 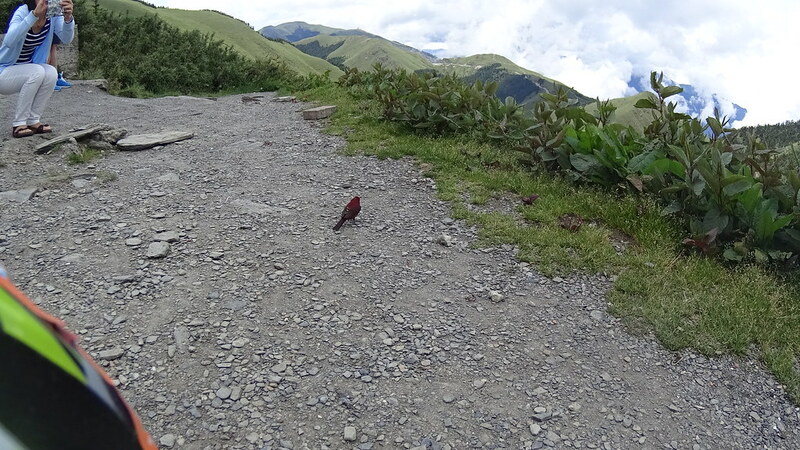 Little red bird trying to find snacks at the parking lot.